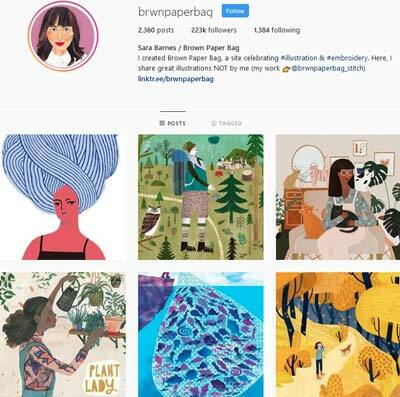 There’s no shortage of illustrators on Instagram but finding art that you like isn’t always the easiest task. 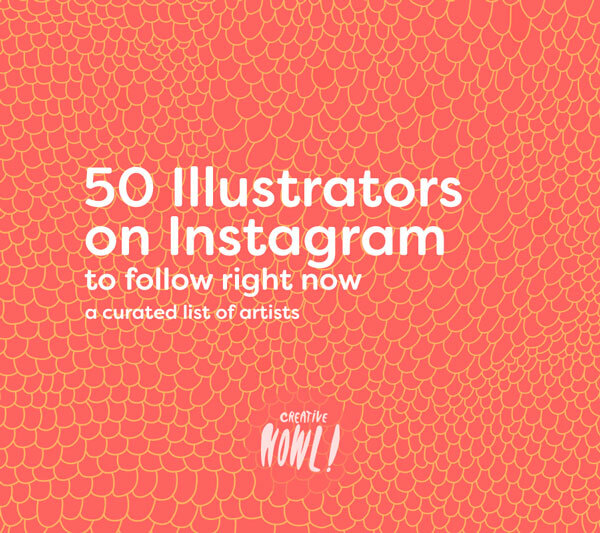 That’s why I created this list of drawing artists on Instagram that are worth a follow, you can easily browse the list and find new artist pages to check out. 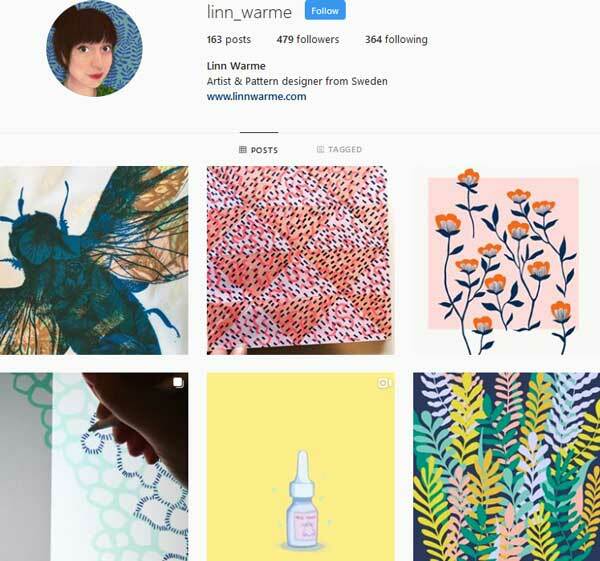 Linn Warme is a illustrator & pattern designer with passion for nature and all the little creatures in it. 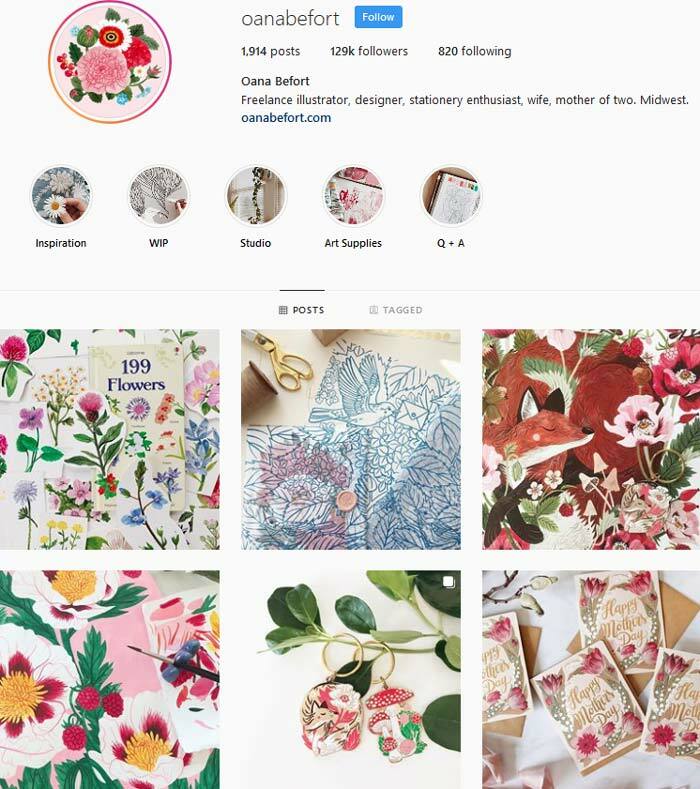 Her creations are often inspired by nature & floral but there’s a great variations in her feed. 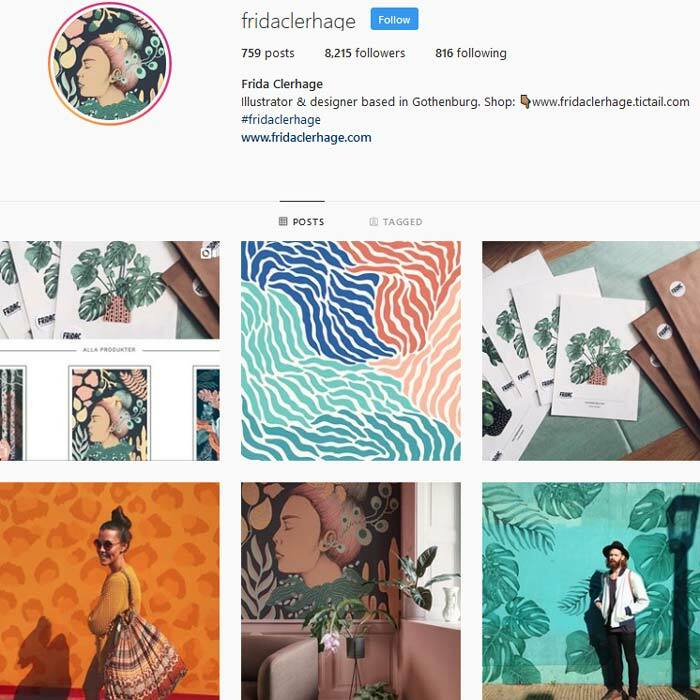 Another big part of her Instagram feed is filled with pattern designs, both floral & abstract/geometrical. 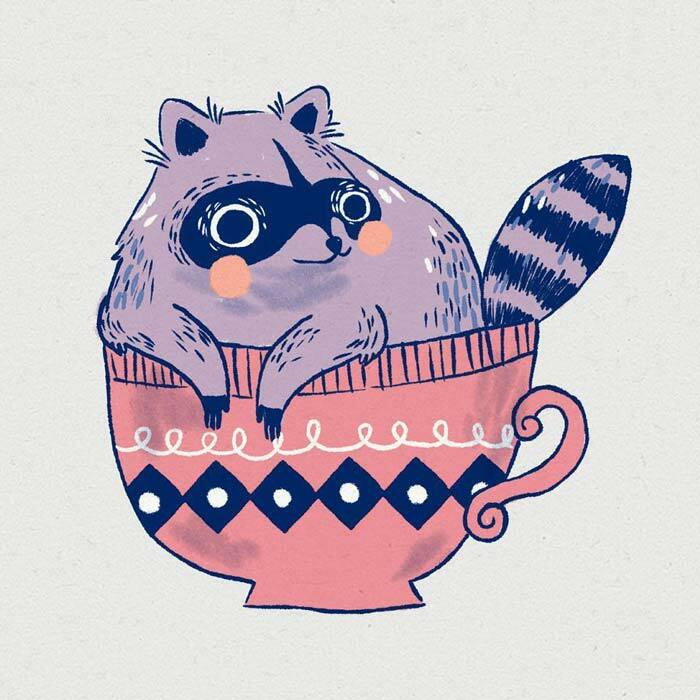 Technically beautiful drawings filled with quirky details and charm. 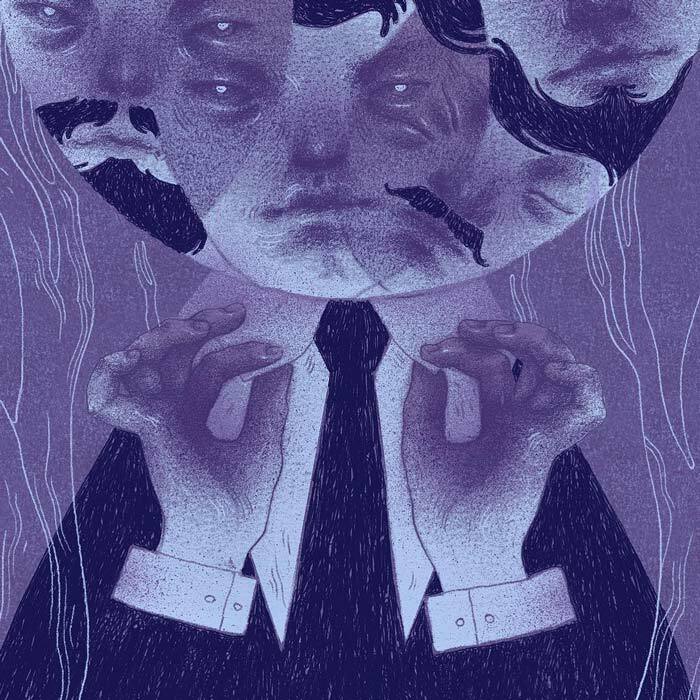 Carlotta Notaro is an illustrator and animator from Italy. 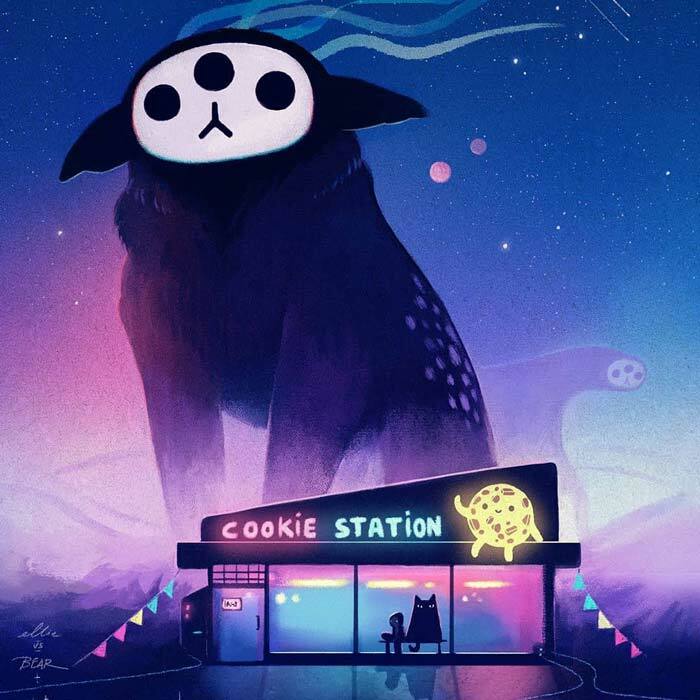 She has a unique and playful style that combines hand drawn drawings with digital coloring and editing. 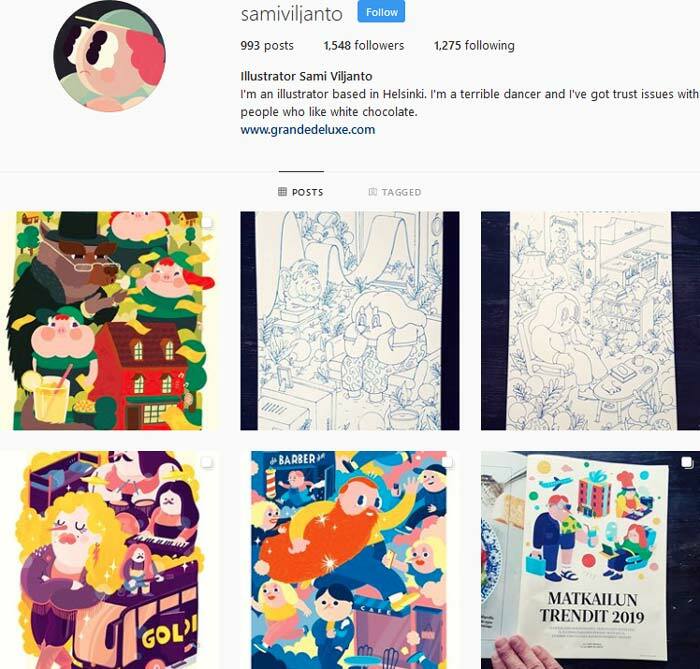 Her feed is really entertaining and you can tell she’s having fun with her Instagram (at least it looks so!). 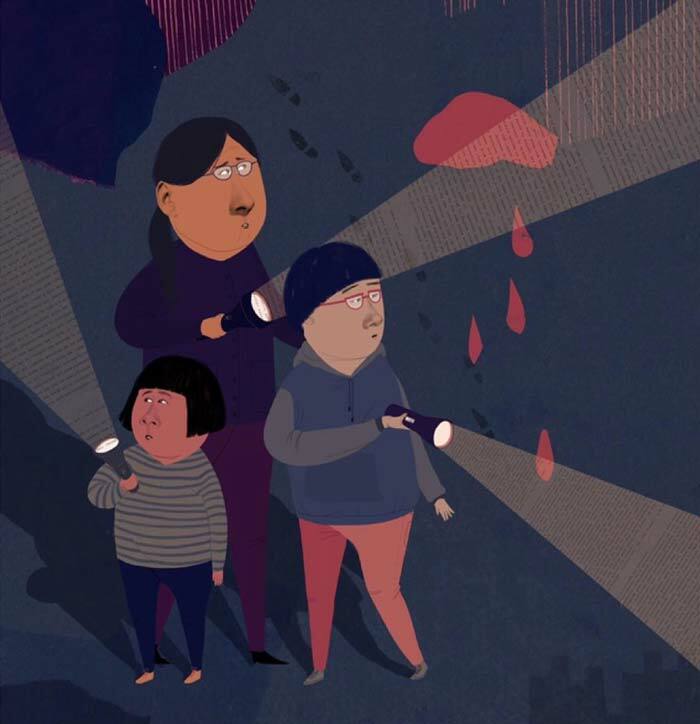 Expect cute & lovely illustrations & animations from Carlotta. 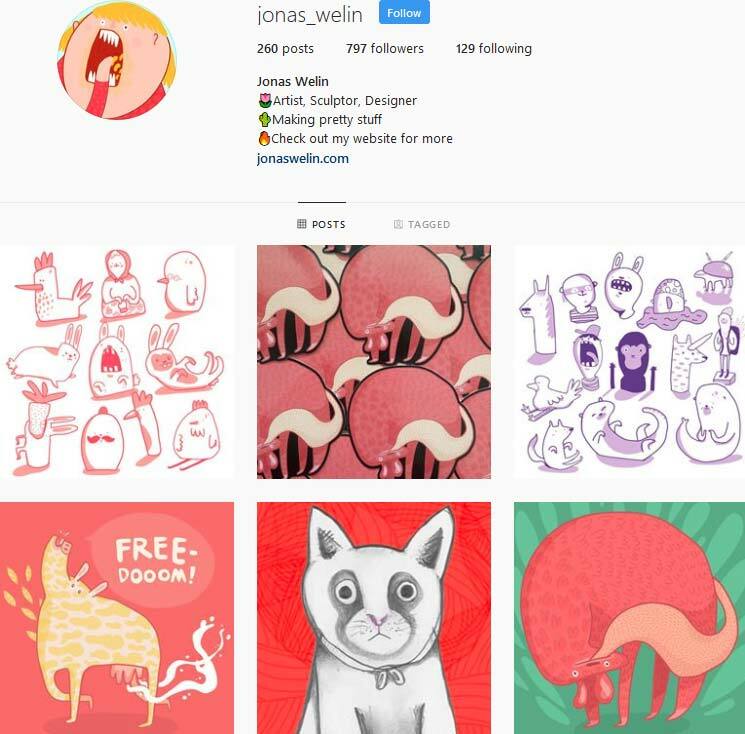 Jonas Welin is a Swedish artist & designer. 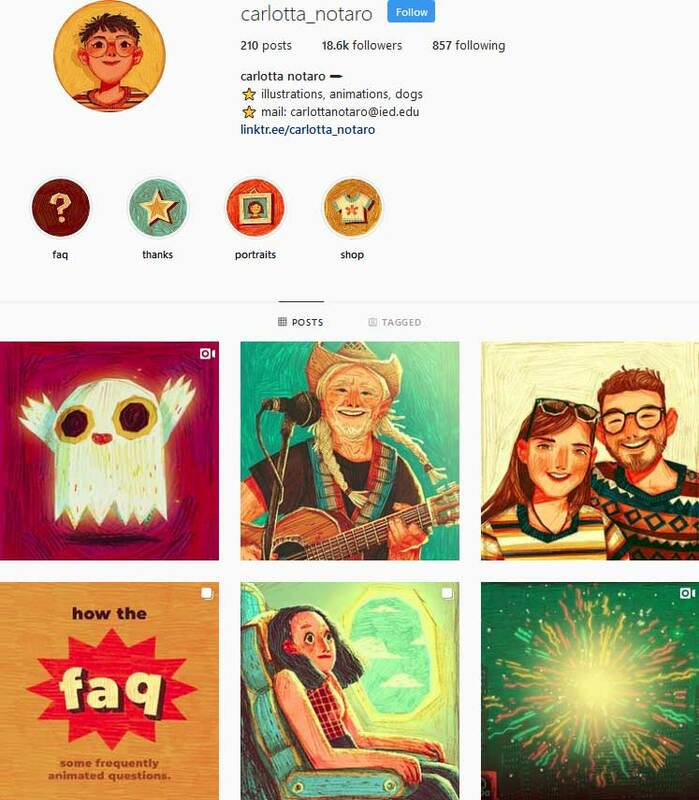 His Instagram feed is a mixture of mostly digital illustrations & hand made sculptures, everything in his own colorful style. 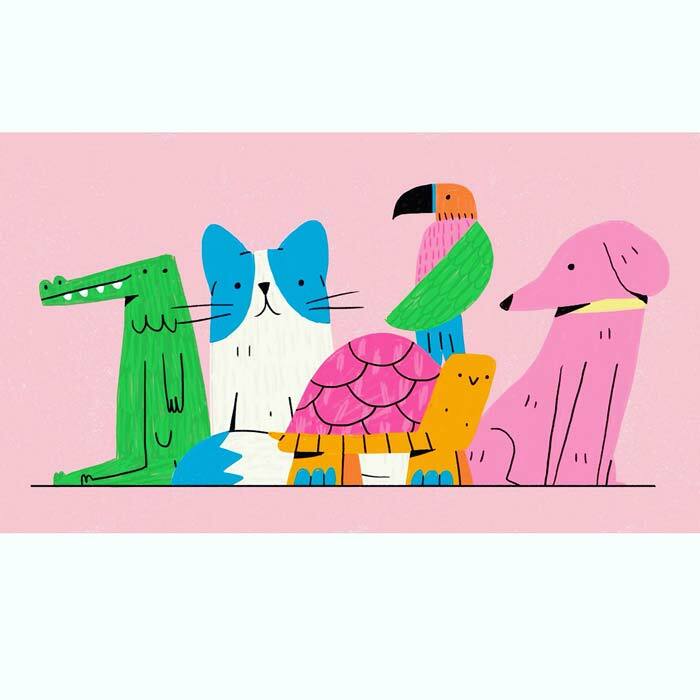 Cute animals, bright colors & screaming faces. 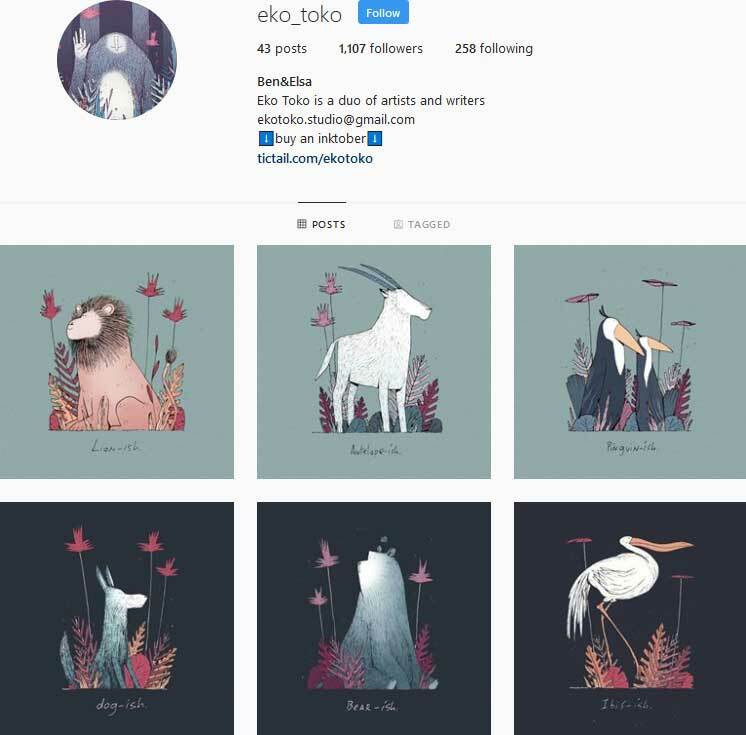 Eko Toko is a artist duo (Design by Ben Bauchau & Colors by Elsa Lamy) from Brussels, Belgium. 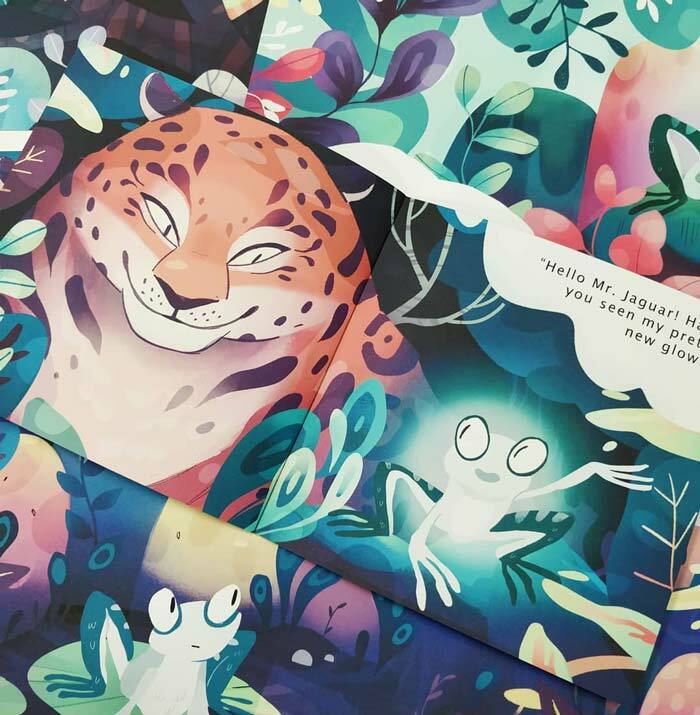 They create these wonderful imaginative creatures & forest landscapes filled with mystery & a ton of charm. 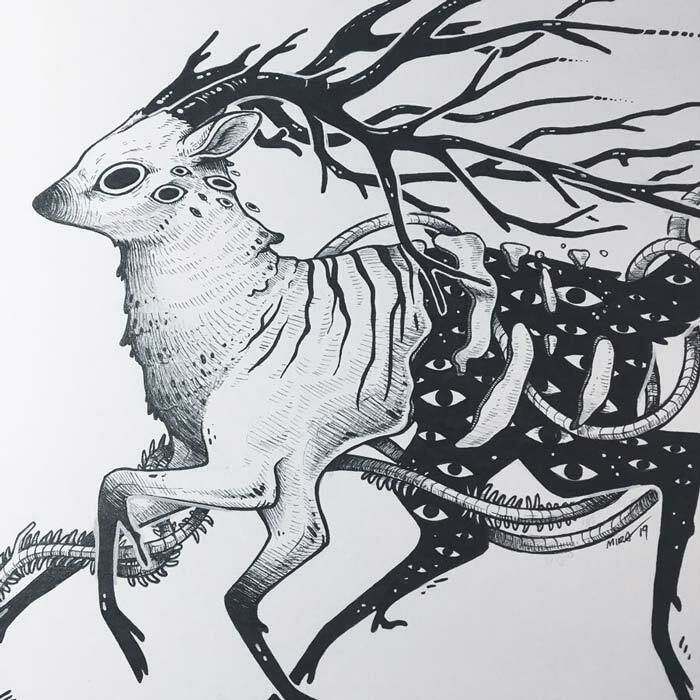 If you want to read up on their inspiration behind one of their creatures you can check out the story behind it over here on our blog. 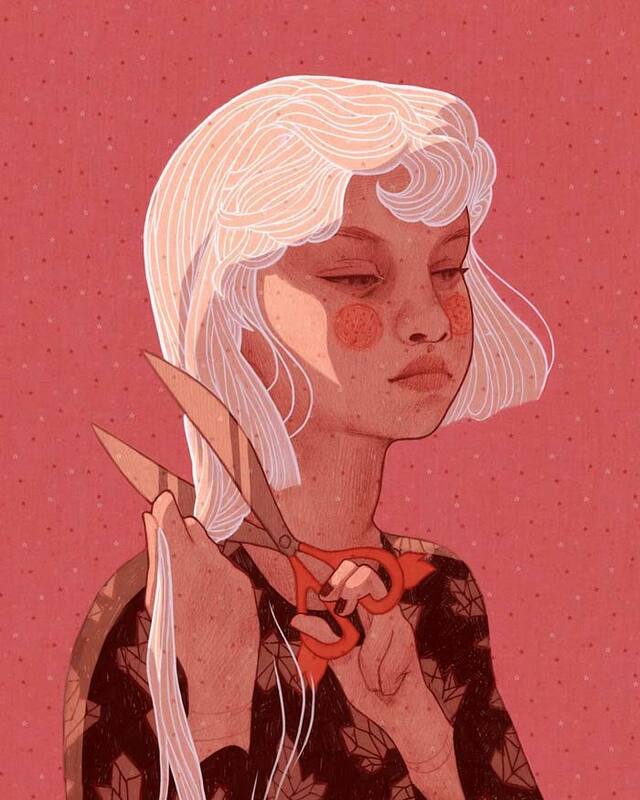 Ellie (Ellie vs Bear) is illustrator & visual artist based in Brussels, Belgium. 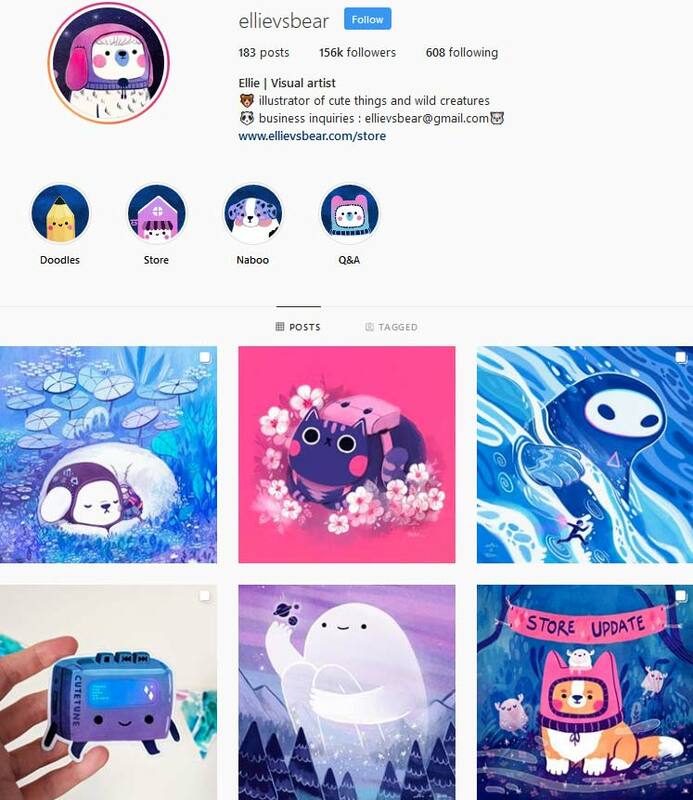 Her work is filled with cute bear/cat/dog-like creatures and a fantastic use of vibrant colors. 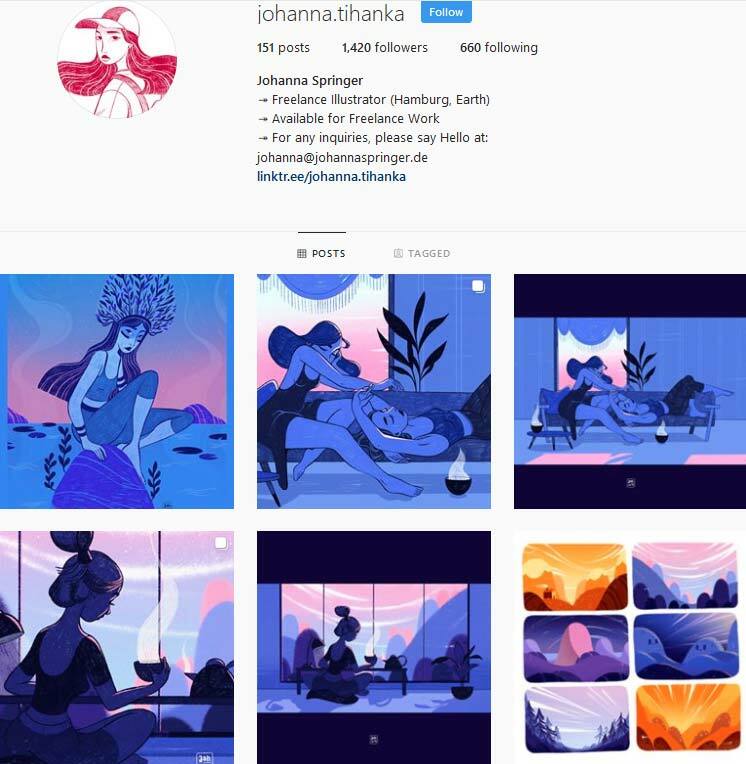 Johanna Springer is a German illustrator, on Instagram you’ll find a lot of portraits & character designs with inspiring use of color & shadows. 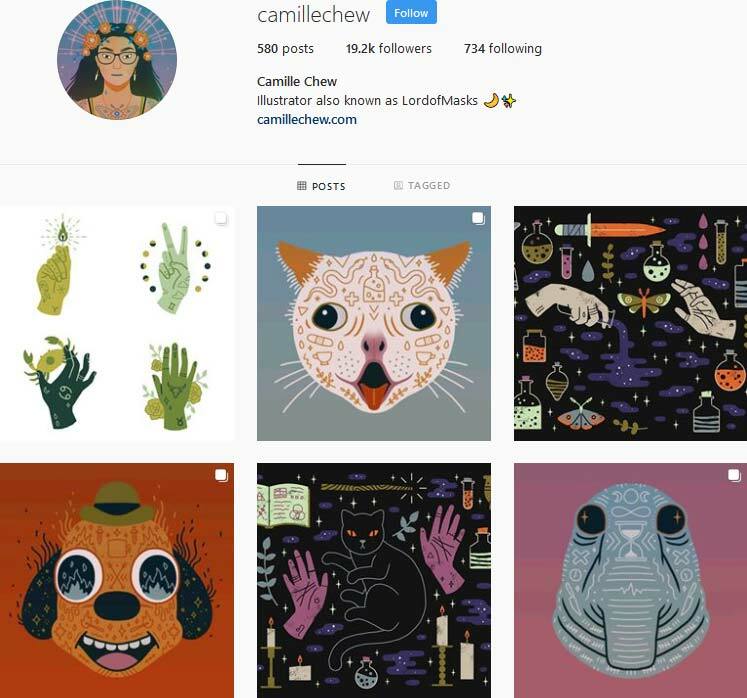 Camille Chew is an illustrator that work with mythology & the occult in her art, often with a lingering mystical feeling hovering over her illustrations. 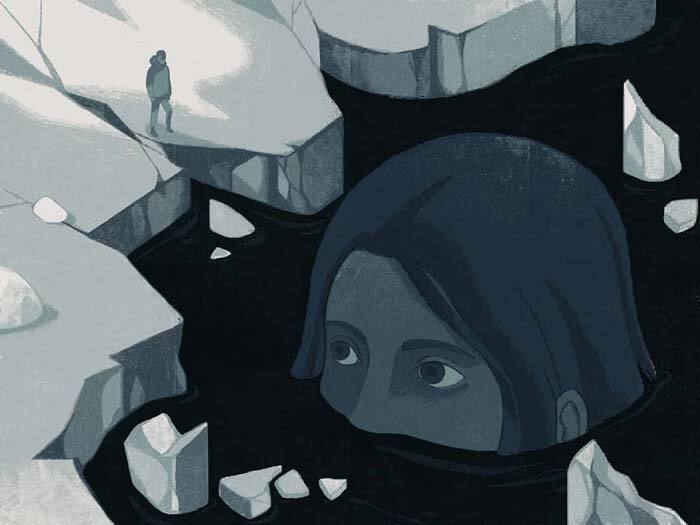 Miranda Zimmerman makes these dreamlike (or nightmarish?) 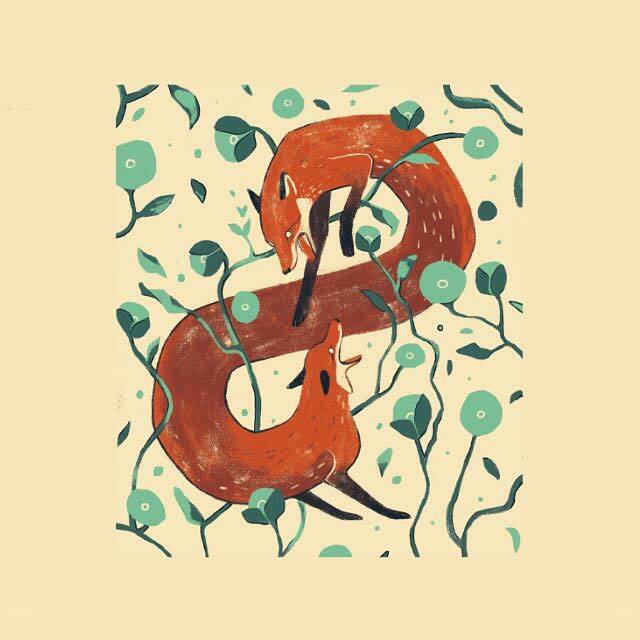 creatures with organic elements growing and flowing through them. 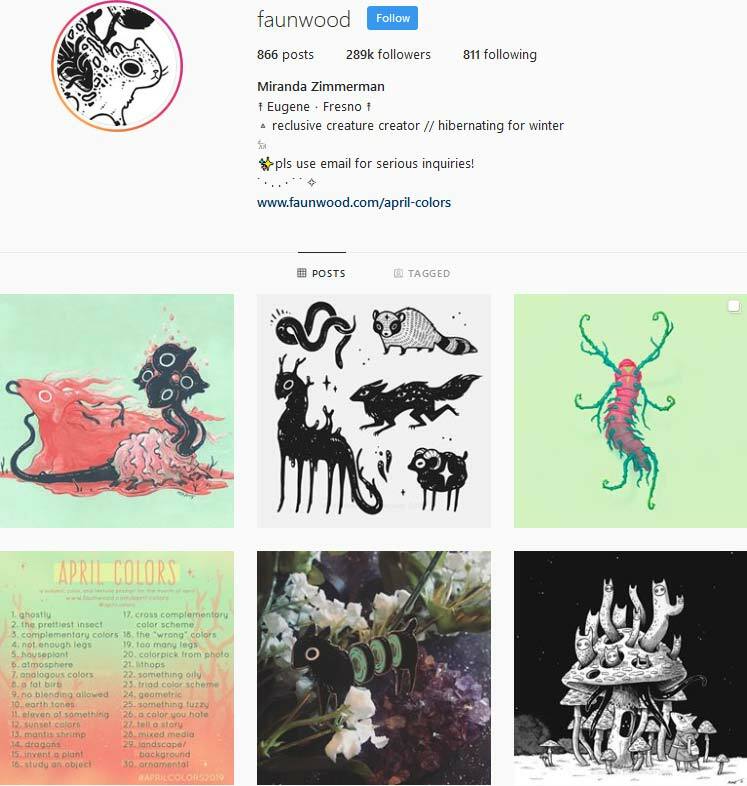 With a background in science illustration Miranda is great at creating fictional beasts & creatures that feel like they could be real in another dimension. 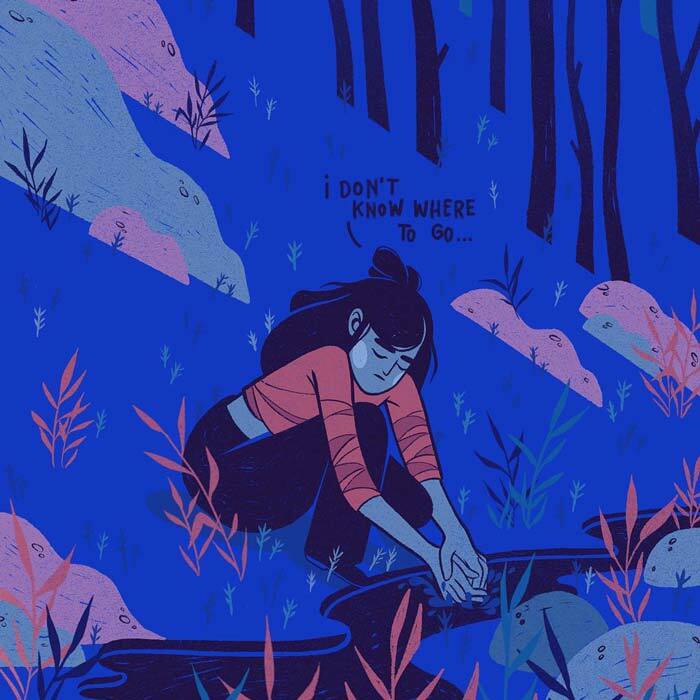 Taylor Price is a illustrator living in Los Angeles, USA. 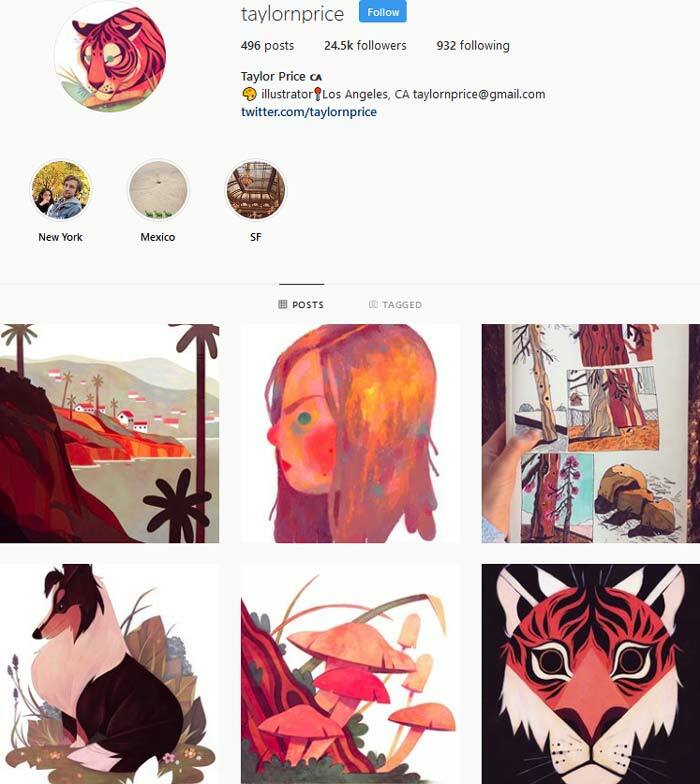 In her Instagram feed you’ll see her work with animals and nature drawn with her excellent use of bright and warm colors. 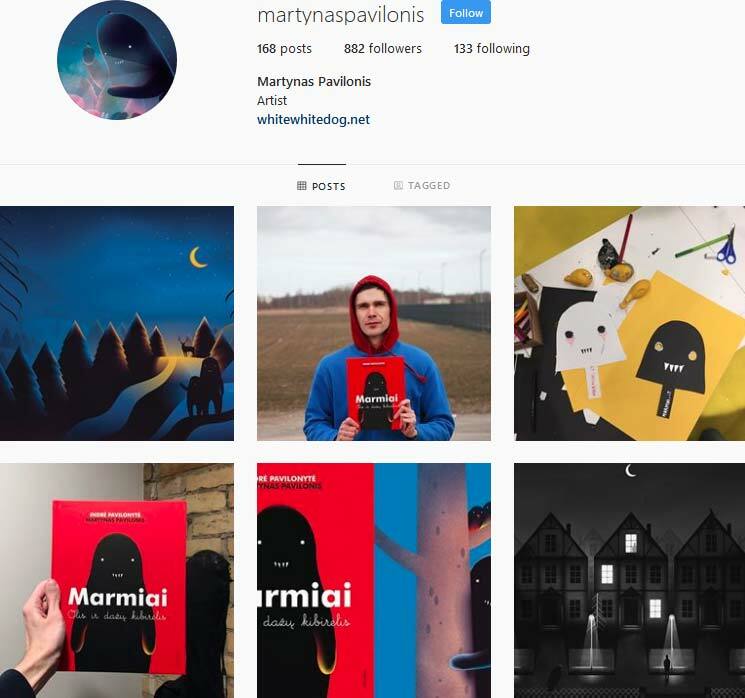 Martynas Pavilonis is a graphic artist and illustrator from Lithuania. 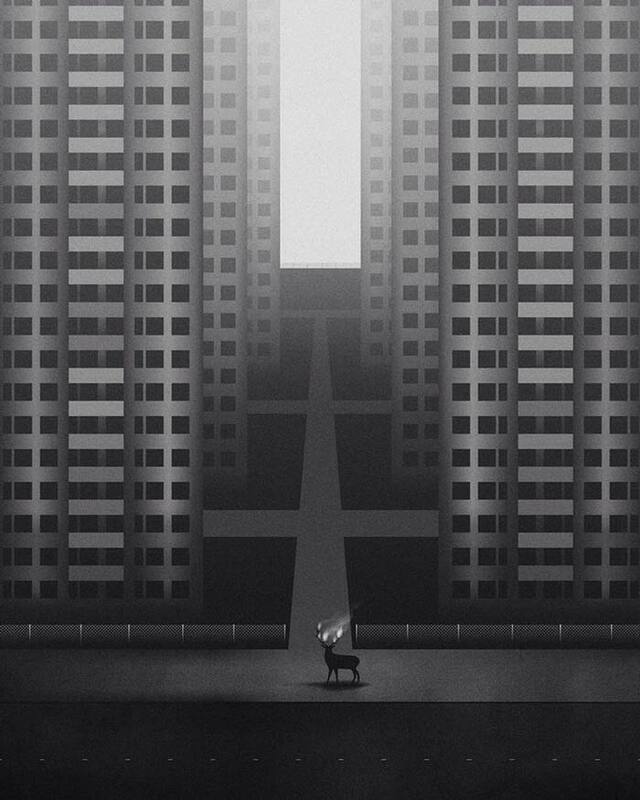 In his work he creates these landscapes and scenarios that just oozes with mystic. 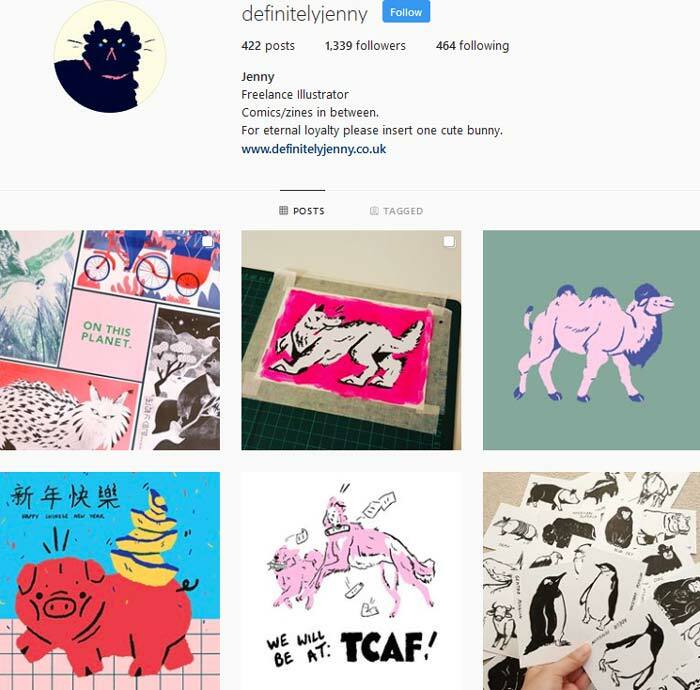 Definitelyjenny (Jenny Tang) is a illustrator with a great fun drawing style. 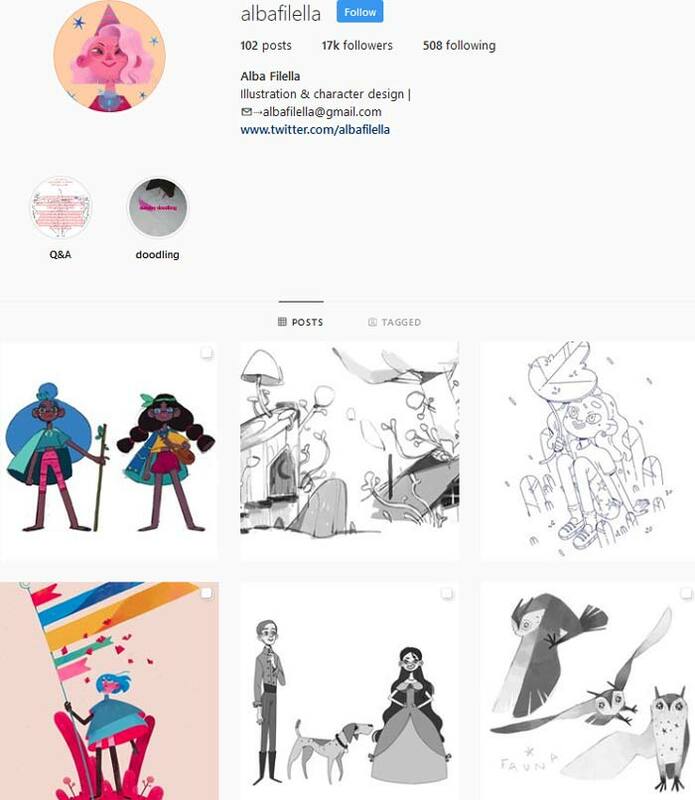 Her Instagram is a entertaining place filled with characters and animals that all feels like they have their own story behind them. 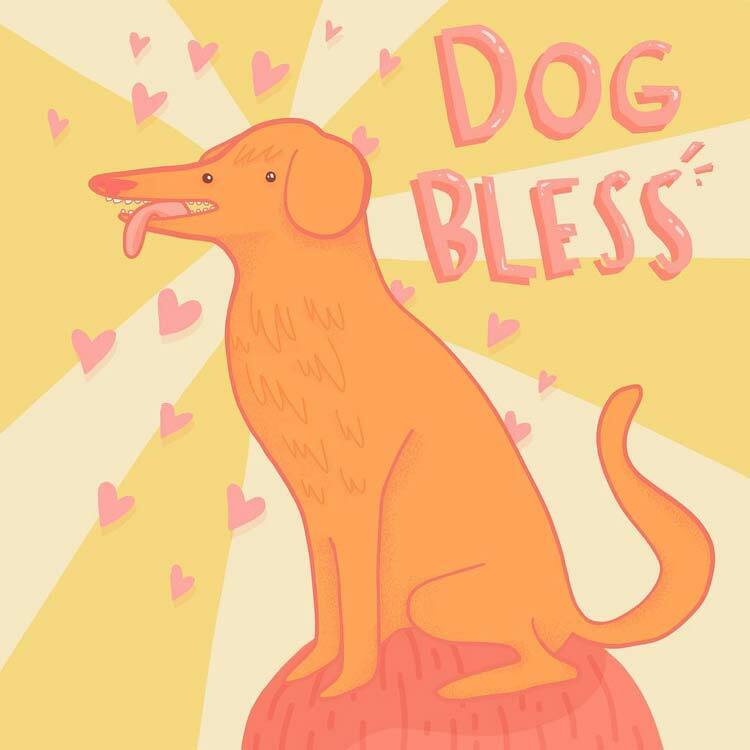 Read more about Jenny and her inspiration behind her comic “Potato Love” over here. 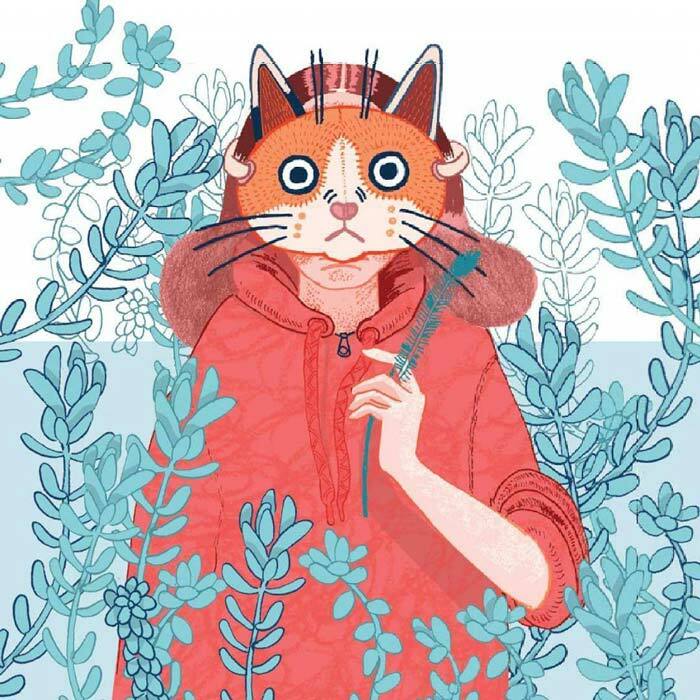 Lydia Hill is British freelance Illustrator and 2D designer. 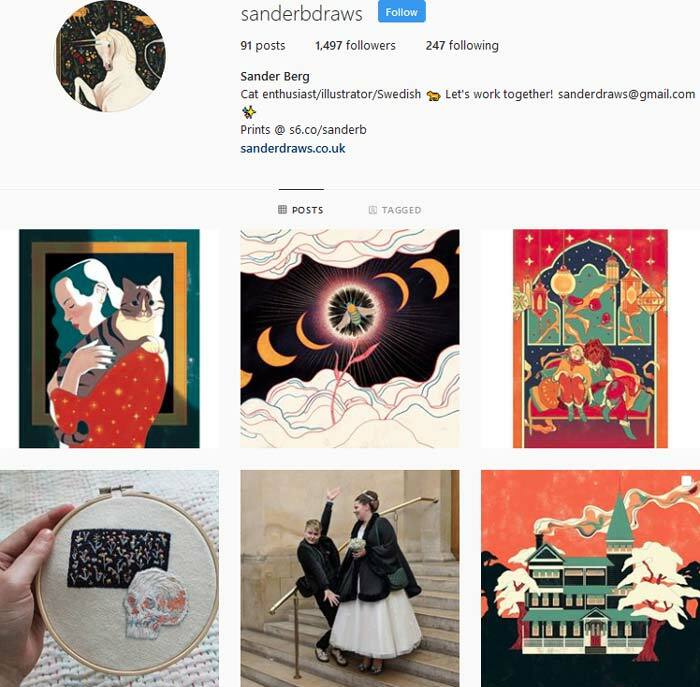 On her Instagram you’ll find every from editorial work, snippets into her creative process and of course her lovely lovely illustrations. 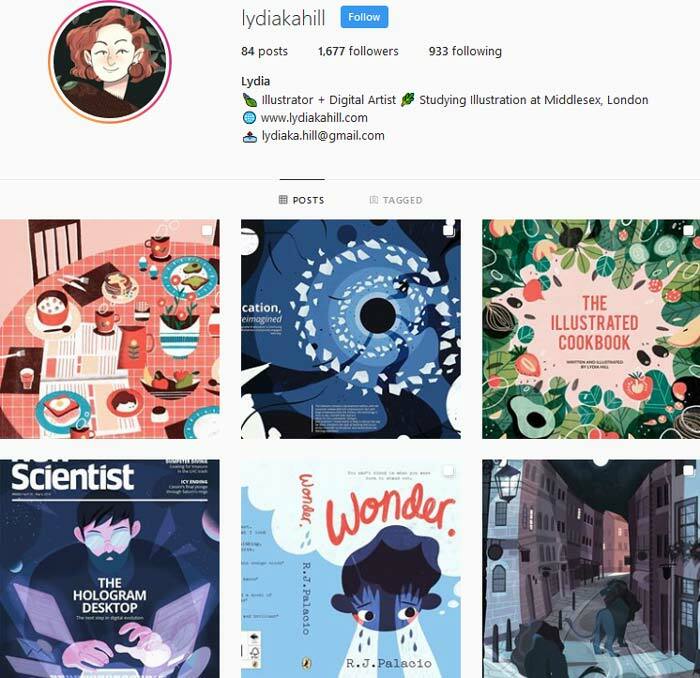 I keep mentioning this for several others on the list but I especially adore Lydia Hill’s use of colors! 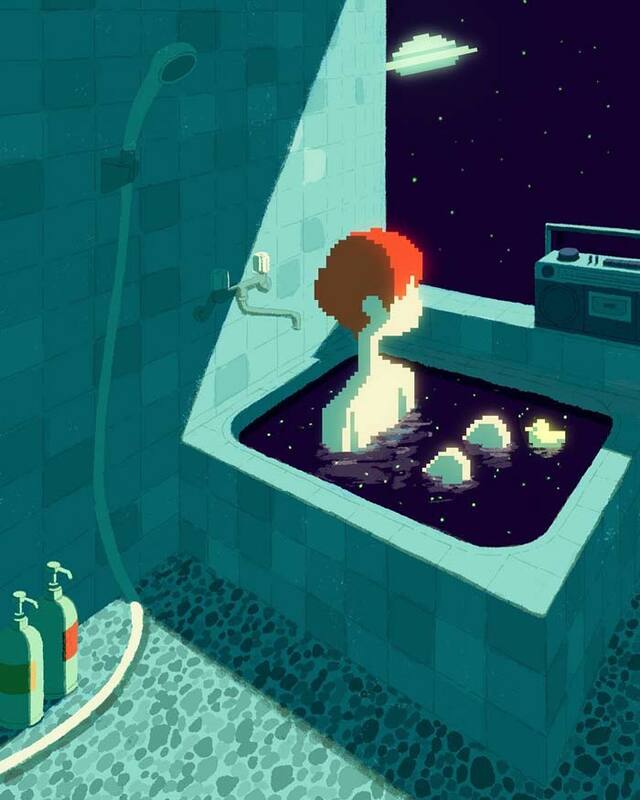 Muhammed Sajid is an illustrator from Bangalore, India. 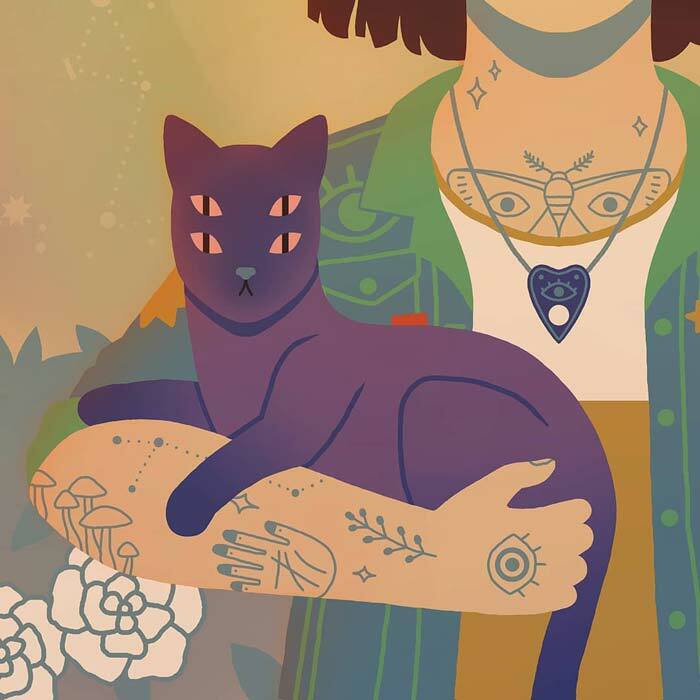 With a colorful palette he creates illustration filled with details and life. 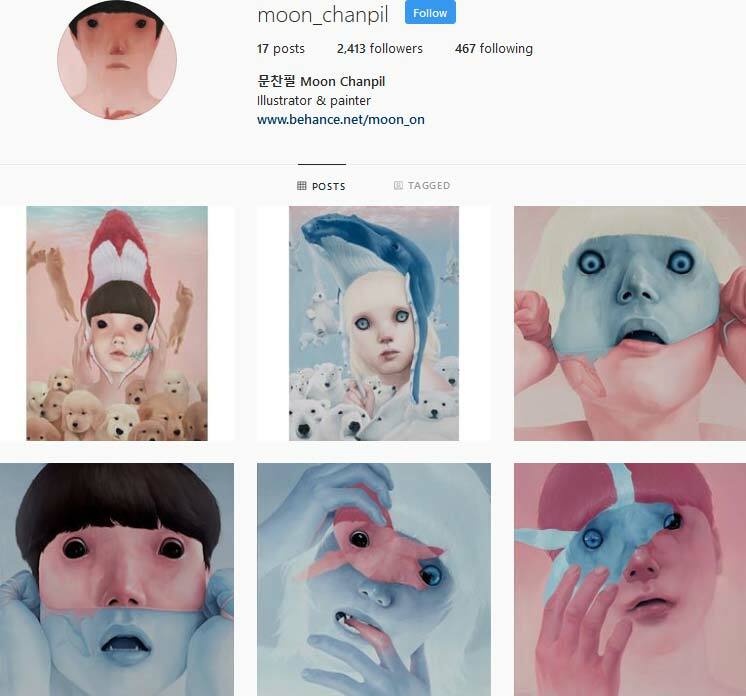 Moon Chanpil (문찬필) is a South Korean illustrator and painter that creates these eerie, unsettling and fascinating portraits. 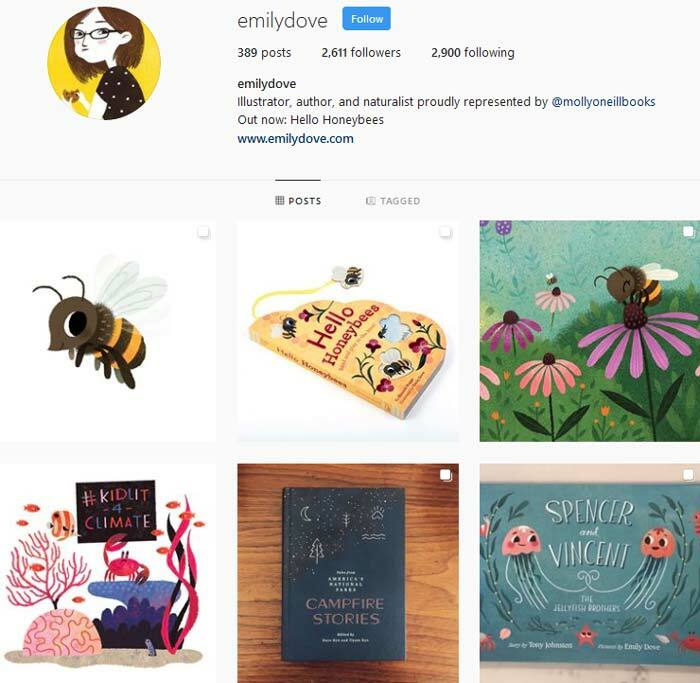 Emily Dove is a illustrator and author, she makes these adorable illustrations of animals and nature landscapes. 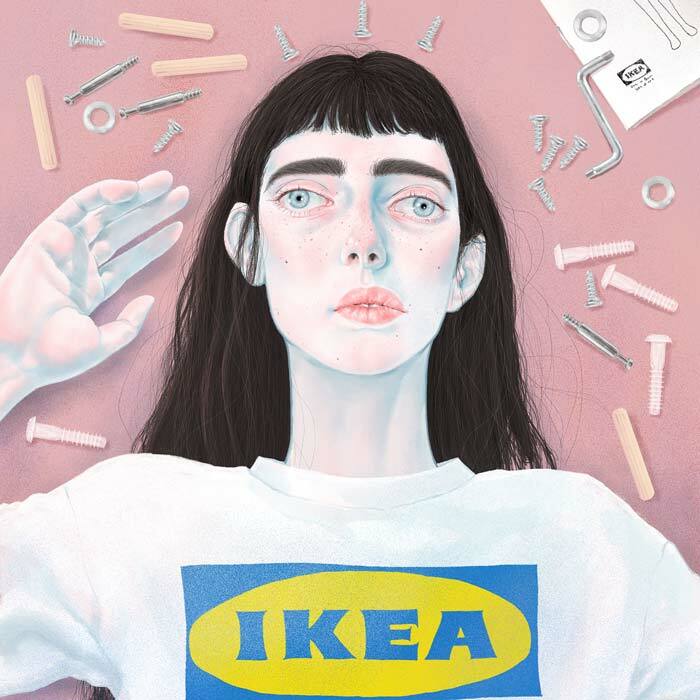 Ida Gust is an artist & illustrator from Sweden. 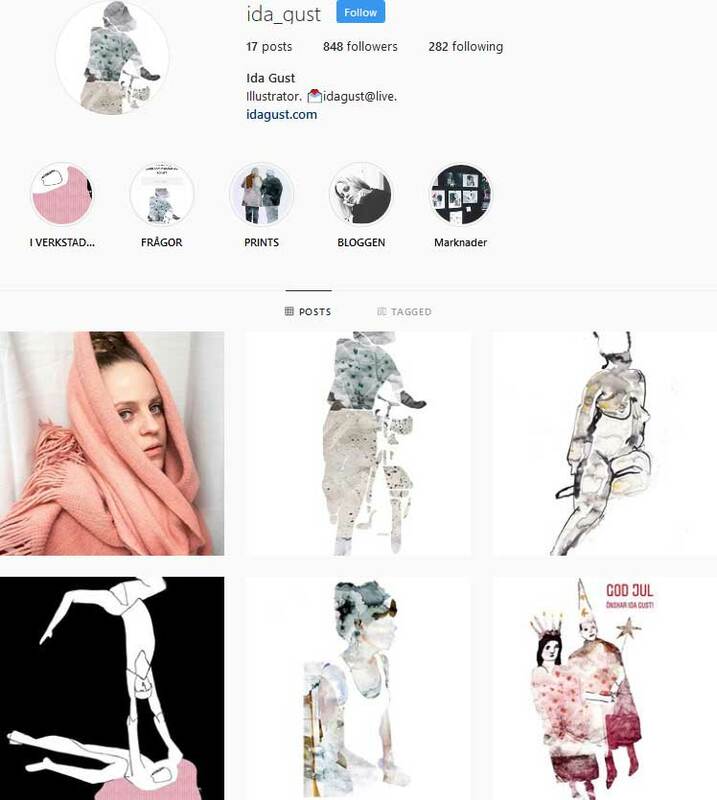 In her illustrations she often mixes traditional and digital mediums, for example using watercolor with digital editing in order to create dream like feelings to her illustrations. 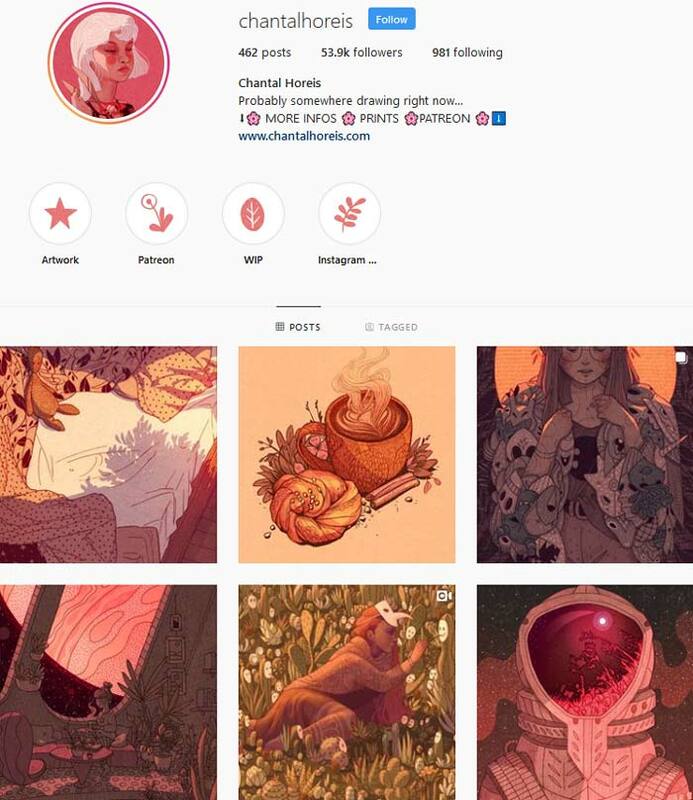 Chantal Horeis is a Swedish illustrator with a breath-taking Instagram page. 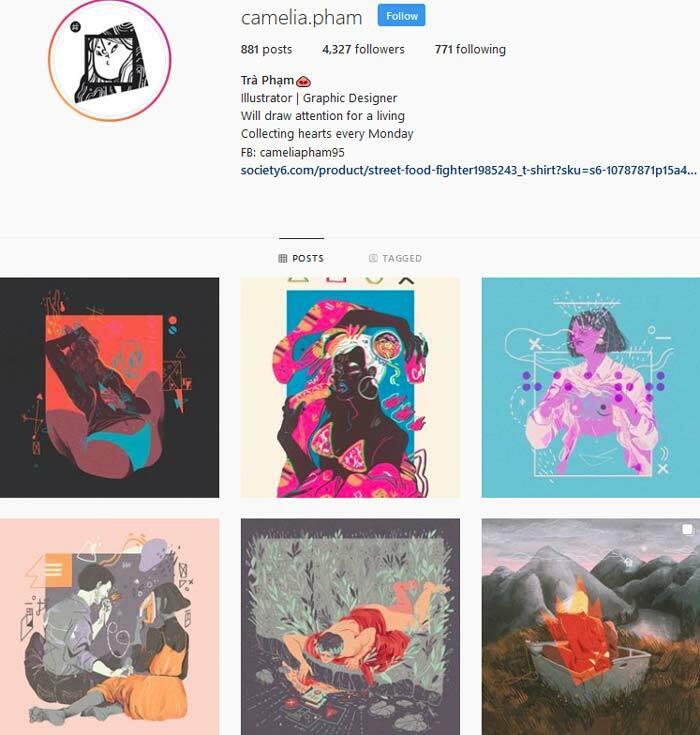 Few artists has such a consistent style and color palette through out their whole feed, a color palette that creates a feeling of the sun settling. 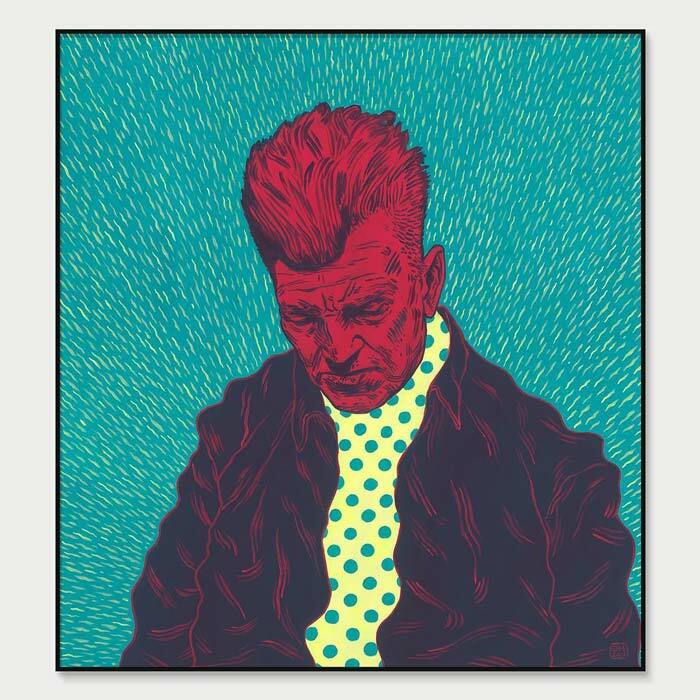 Chantal Horeis makes these portraits that mixes technically stunning drawings with detailed areas filled with patterns for the eye to get lost in. 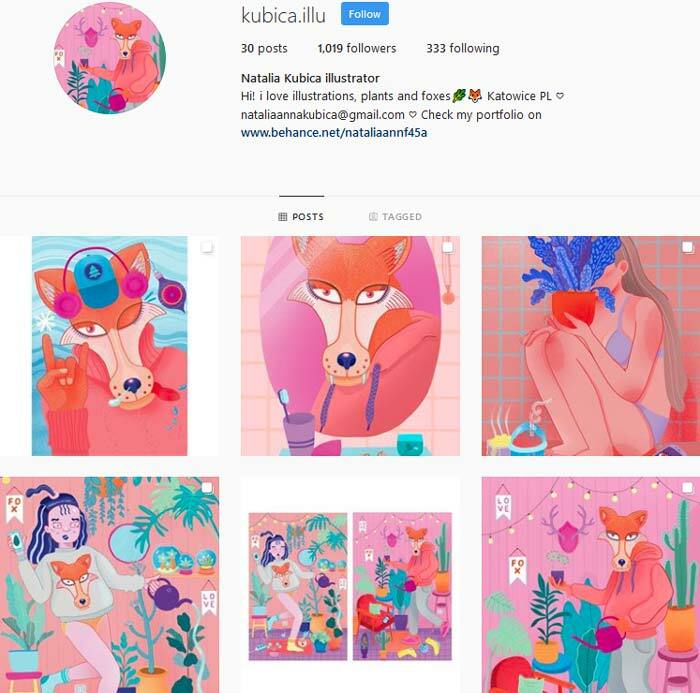 Natalia Kubica is a Polish illustrator that fills her drawings with plants & people hiding behind animal masks, everything in colors that really makes the drawings stand out. 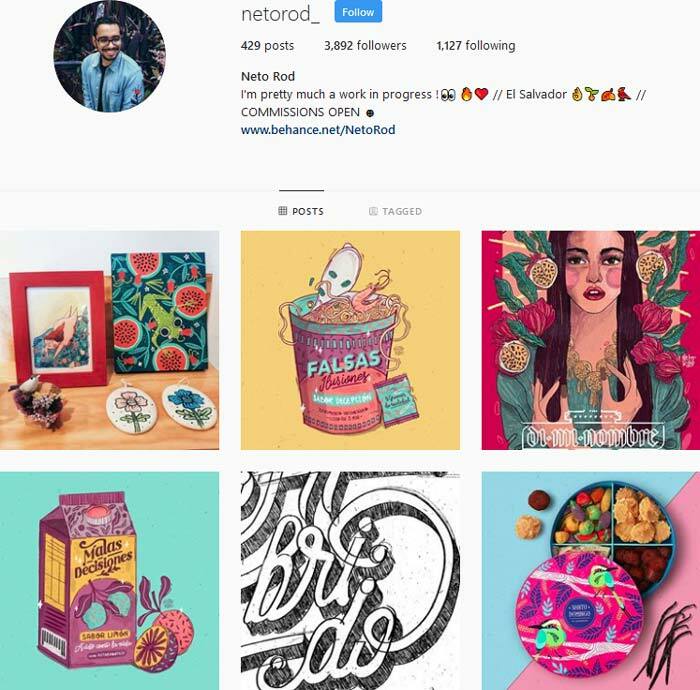 Neto Rod is a illustrator from El Salvador. 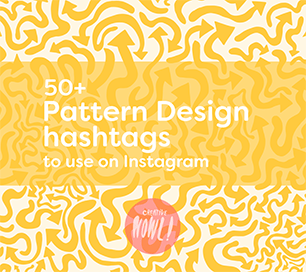 He creates these patterns and drawings that are bound to make you happy with their bright and fun colors and adorable creatures and floral themes. 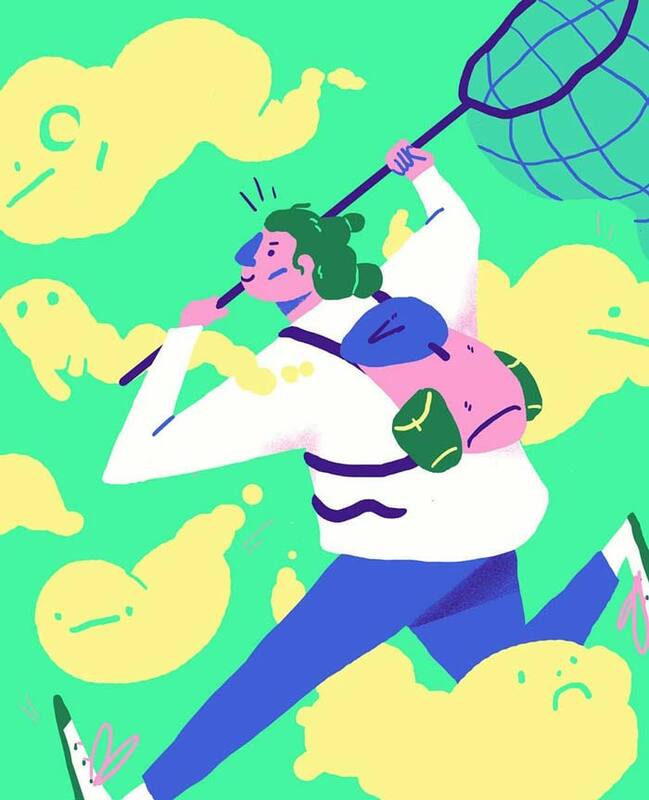 Sami Viljanto is a Finish Illustrator that creates these fantastic bulging characters in different odd scenarios, everything in a color scheme that’s hard to love. 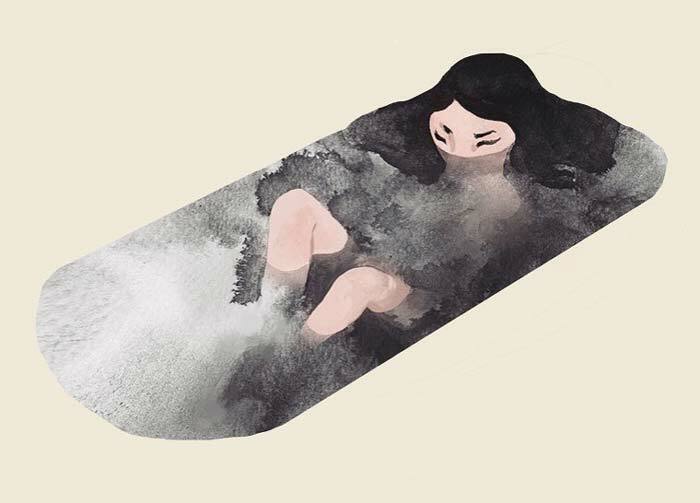 Jayha Drawer is a South Korean Illustrator. 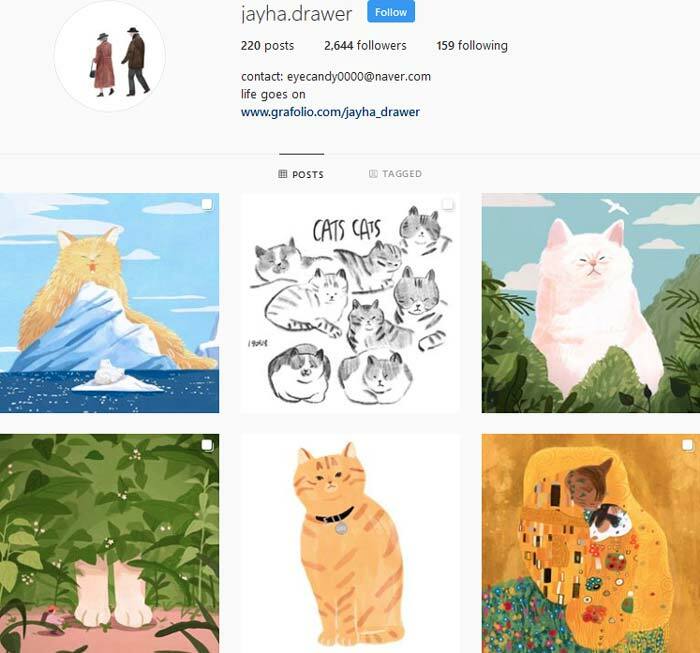 I especially love Jayha’s cat drawings, they’re all fat and cozy looking, like a real cat should be. 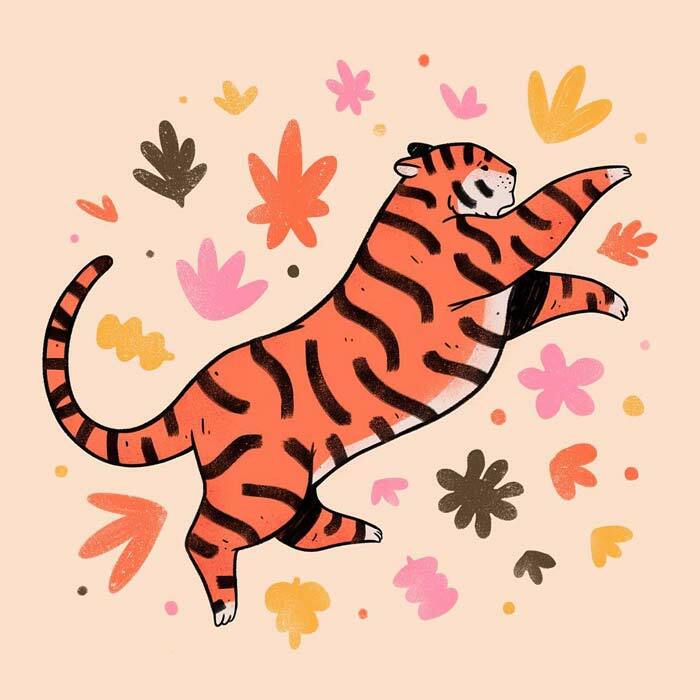 You’ll find lovely illustrations with a ton of charm on Jayha’s page. 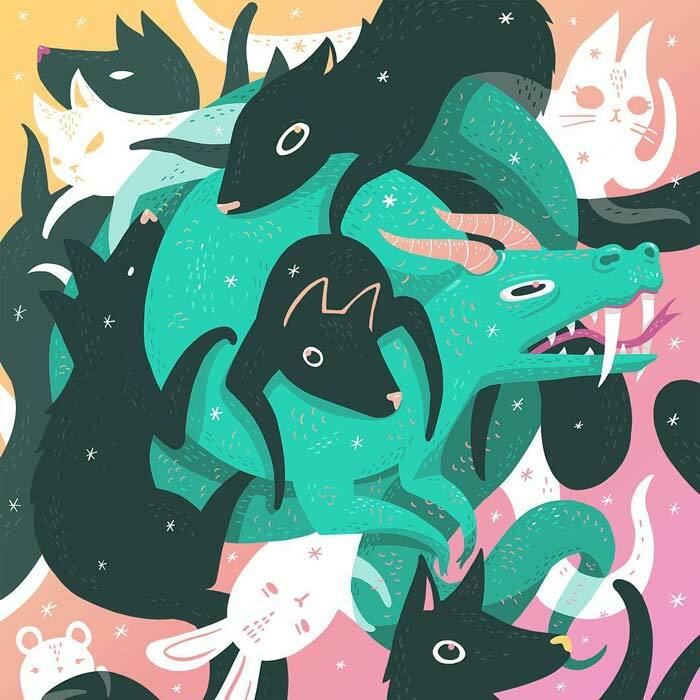 Patrycja Podkościelny is Polish illustrator and graphic designer. 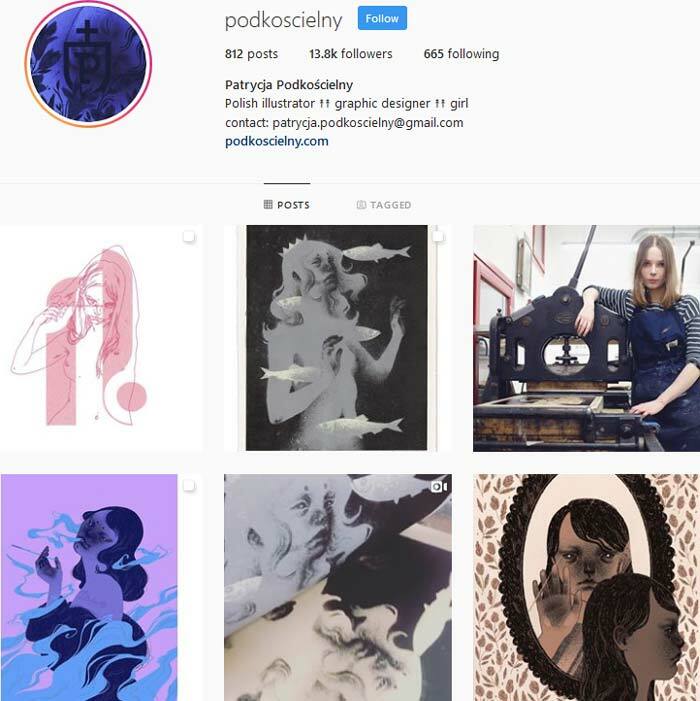 Patrycja is an artist that’s technically superb but also not afraid to play around with her art and make these surreal and truly engaging. 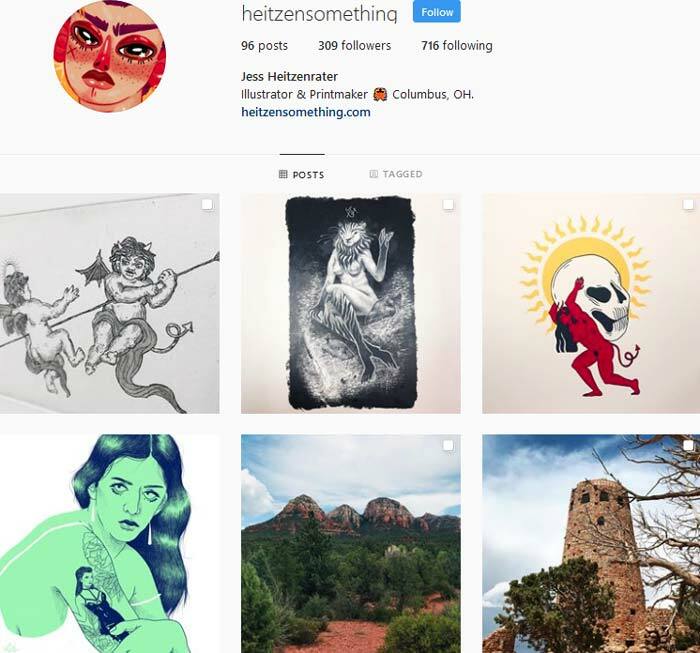 She makes these illustrations & portraits that are filled with intense darkness that I really love. 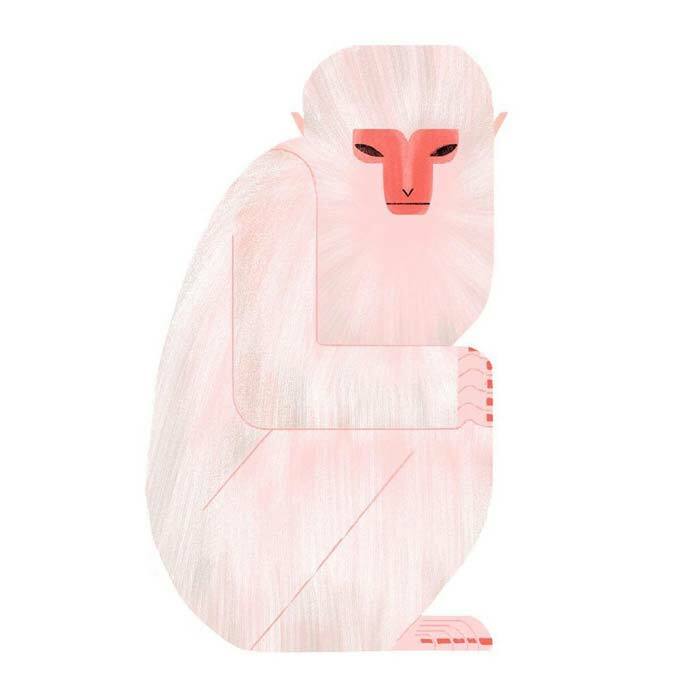 Oana Befort is an illustrator and stationery enthusiast (as she puts it). 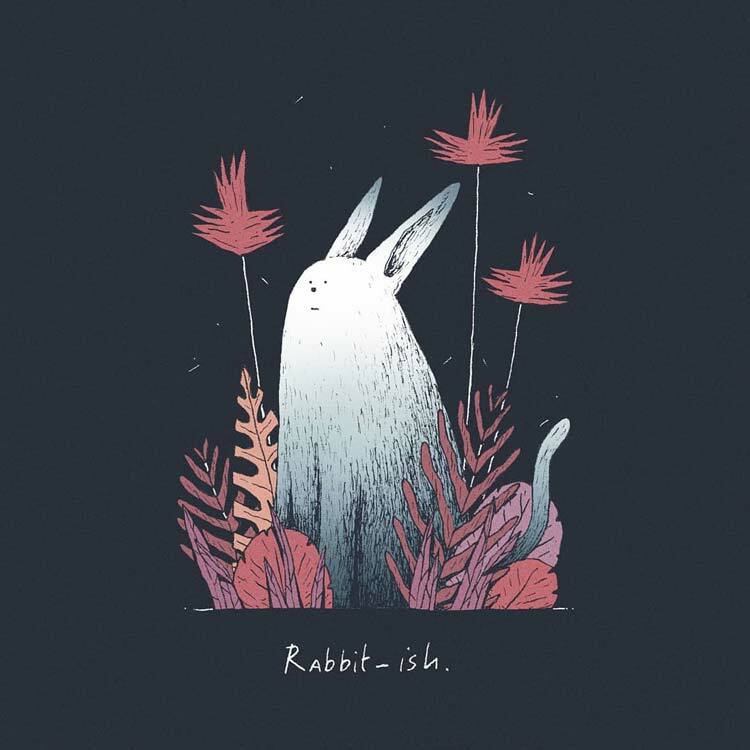 Her illustrations are almost always filled with flowers, plants and a handful of adorable animals here and there. She makes art that makes you happy, it’s everything good put into a piece of art. 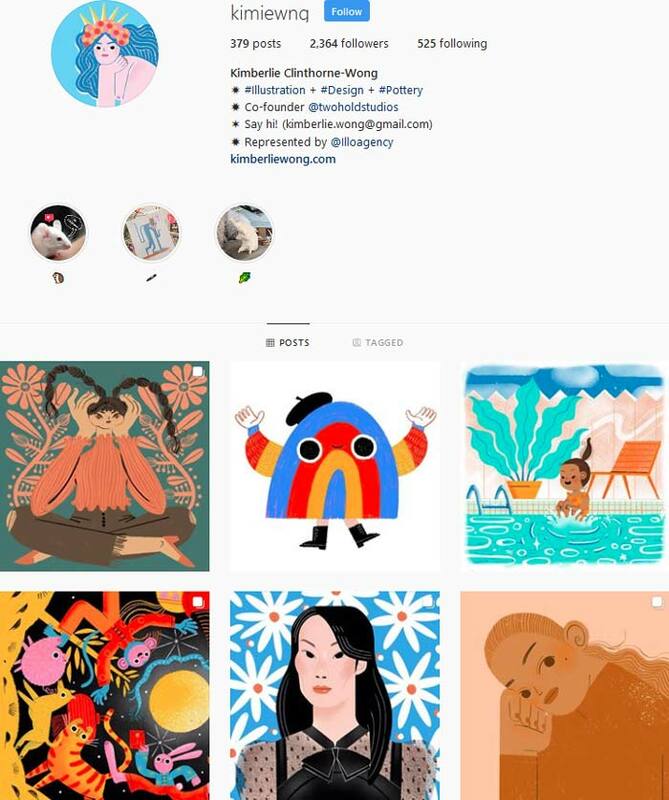 Alba Filella is one of my favorite artists that I follow on Instagram. 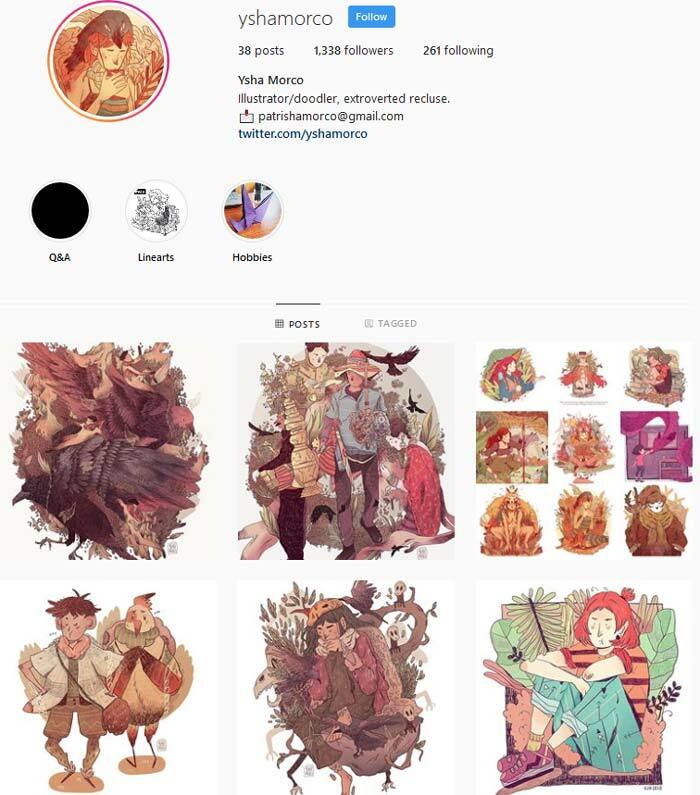 She’s a Spanish illustrator and she creates these imaginative and often badass characters of her. 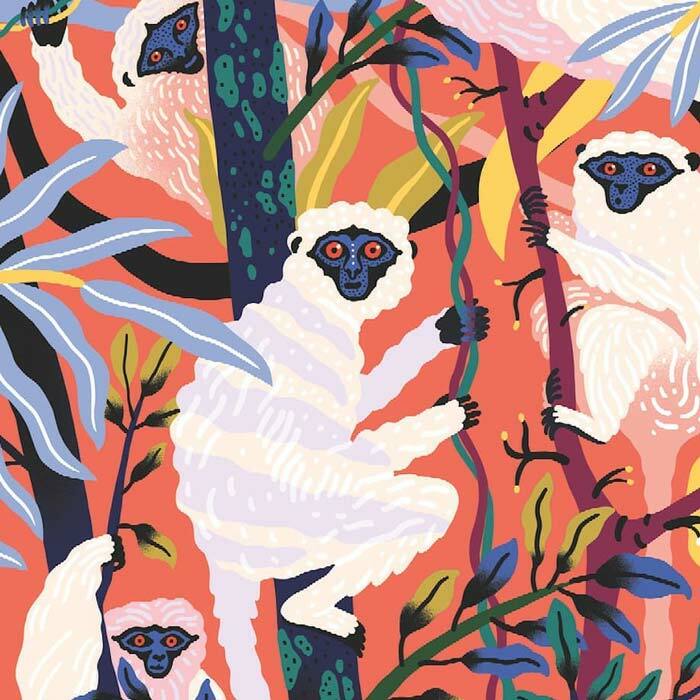 Juliette Oberndorfer is a French artist that creates creatures and nature landscapes that are exploding with color! 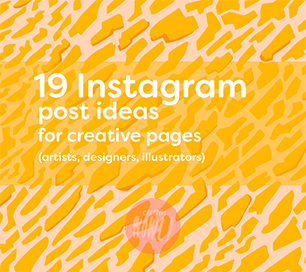 Yet another one of my favourite illustrators on Instagram, it’s a must follow in my book. 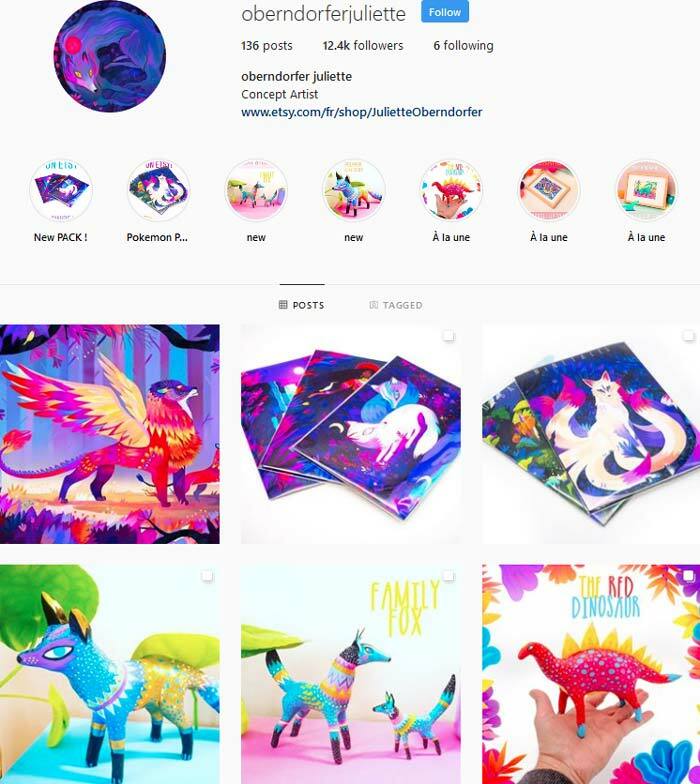 Apart from prints and illustration you’ll also find sculptures & figures on Juliette’s Instagram feed, these are also in her own art style and similar color choices. 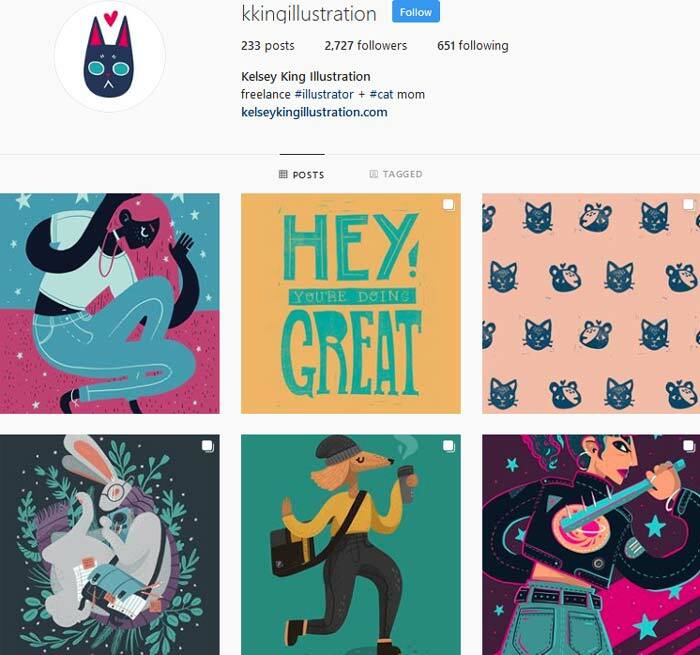 Kimberlie Clinthorne-Wong is an illustrator and ceramicist that makes fun portraits, characters and scenarios with quirkiness and interesting composition, all in a great retro style. 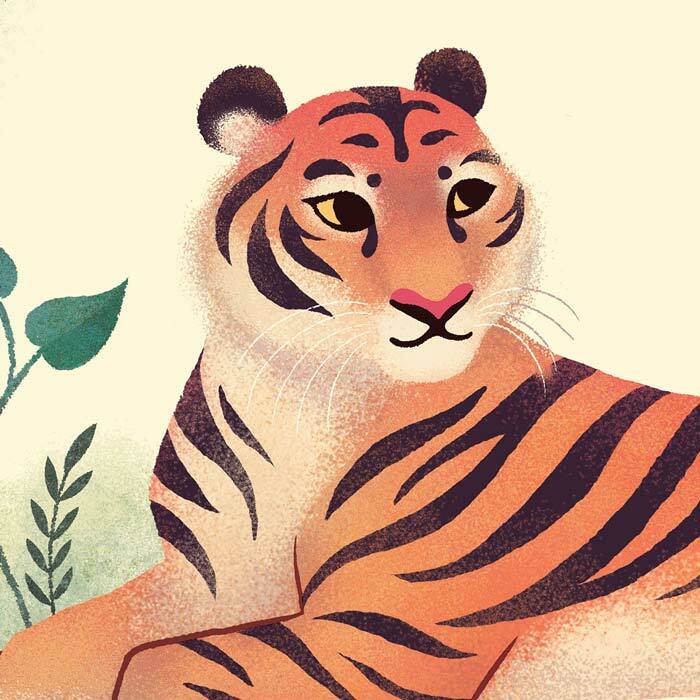 Kelsey King is a freelance illustrator from USA, that makes these lovely digital illustrations, defiantly worth checking out. 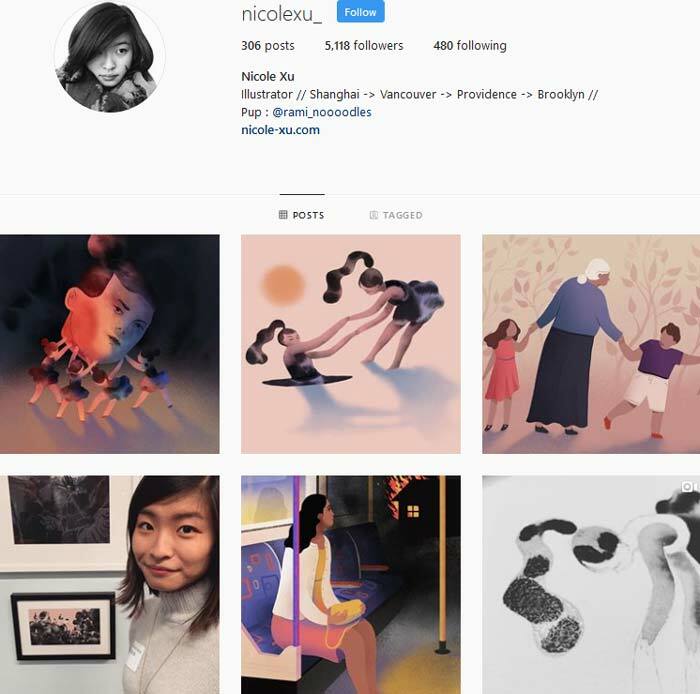 Camelia Pham is an artist that makes these interesting people illustrations, often in creative compositions and with a strong narrative behind them. 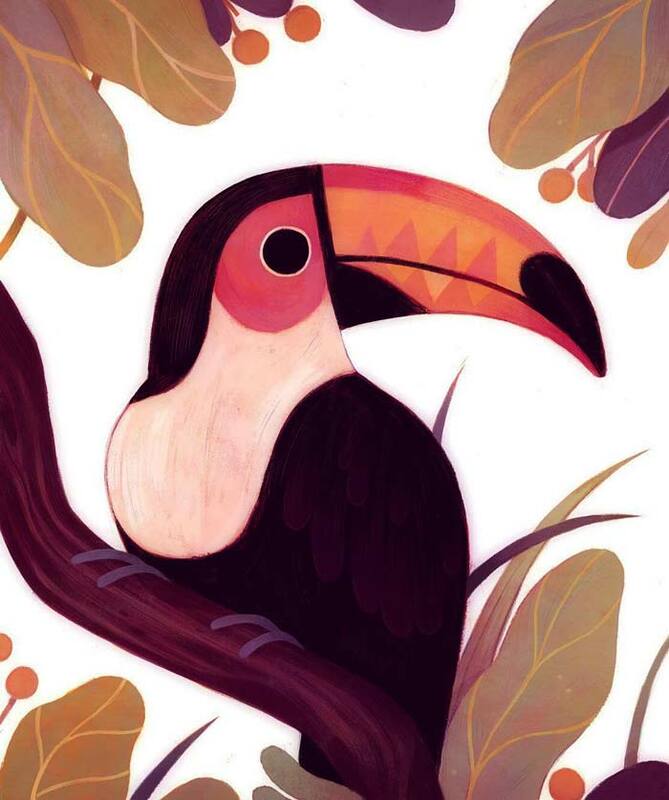 Her color choices are always lovely, toned down colors that gives the art a particular feeling. 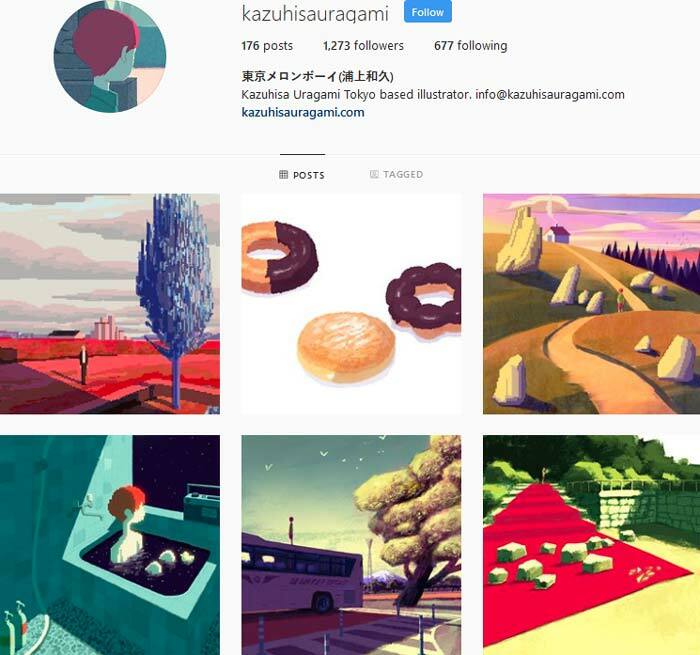 Kazuhisa Uragami is an illustrator from Japan. 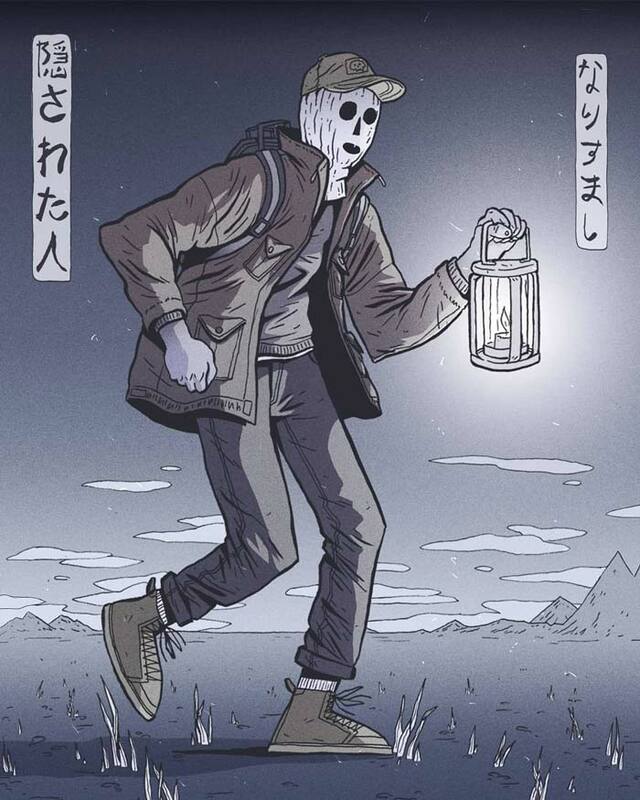 My personal favorites of his work is the one he uses pixelated areas or mixing pixel art and other art styles, it makes it seems like there’s a small glitch in reality where the pixels has broken loose. 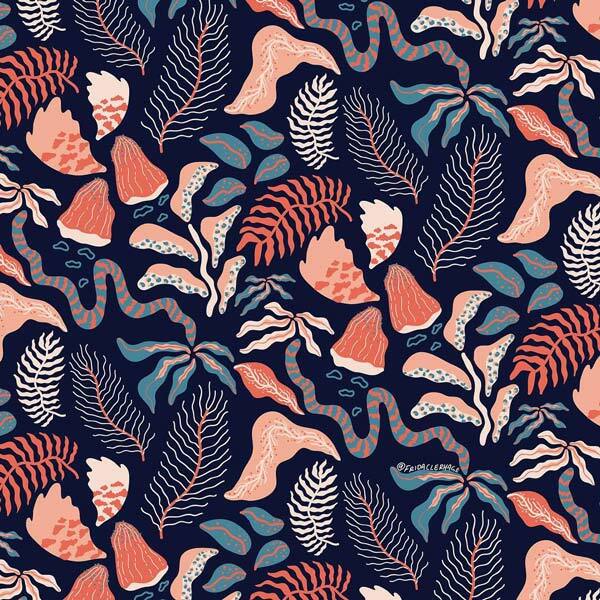 Ysha Morco is an artist that’s great with the details in her drawings, Ysha’s art is packed with patterns and structures in the details. 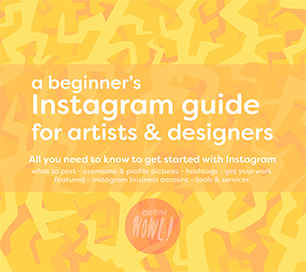 Instagram might not be the best platform to check out such detail filled art but it’s still well worth a follow. 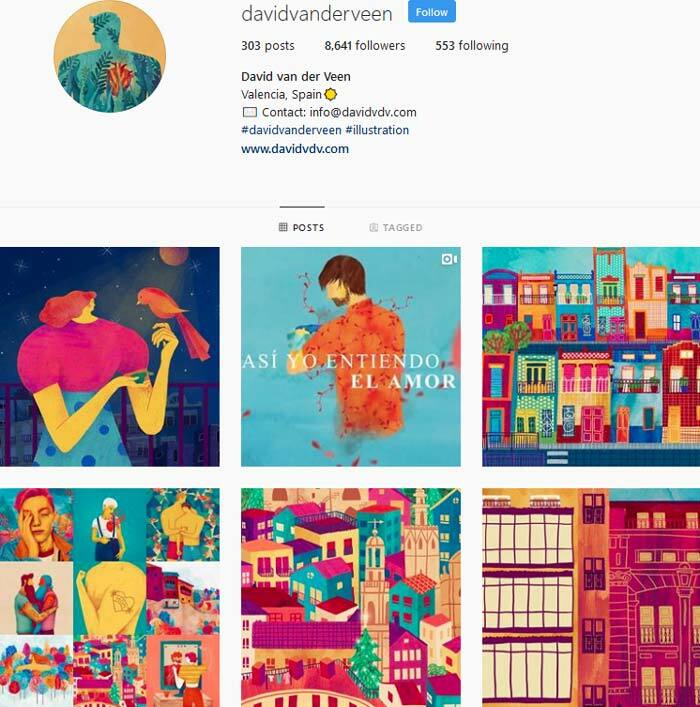 David van der Veen makes graphical illustrations often in a limited color palette. 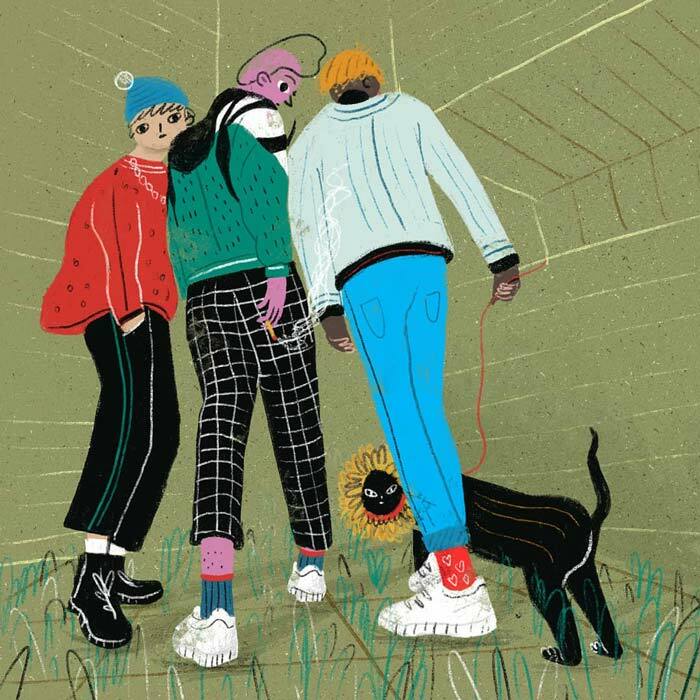 People, places and patterns with a narrative going on in the background. 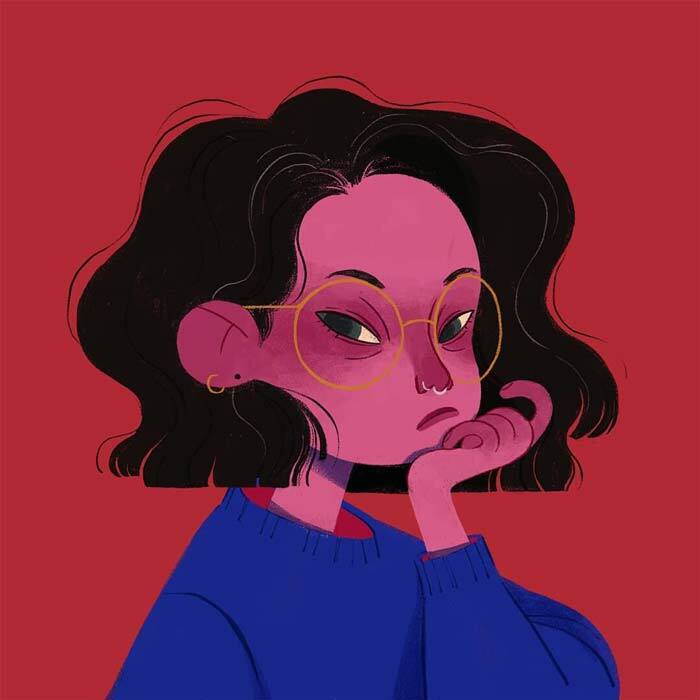 Catalina Vásquez is an animator & illustrator. 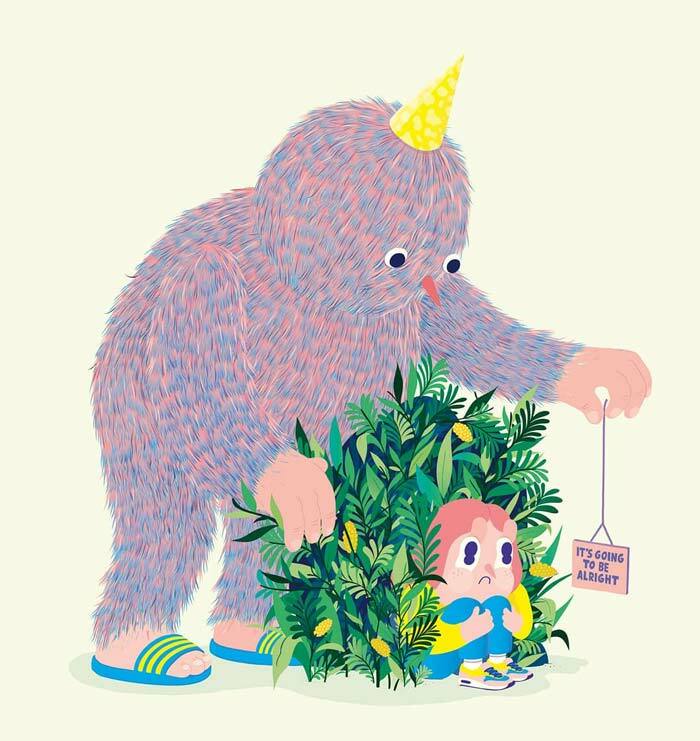 She makes colorful illustrations that have a lovely handmade feeling. 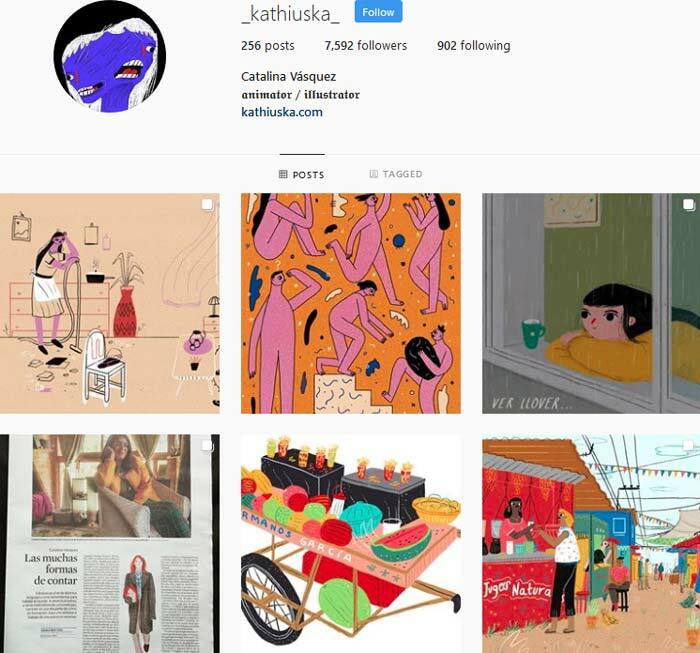 There’s a lot of variation on Catalina’s Instagram feed, editorial drawings, animation, patterns and much more, making it really enjoyable to follow and see what she dose next. 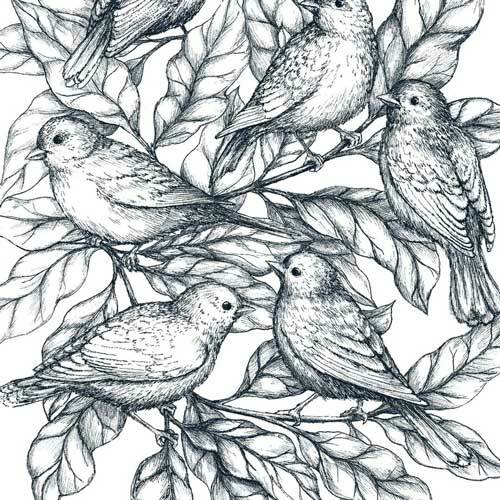 Beatriz Mayumi is an artist living in Sao Paulo, Brazil. 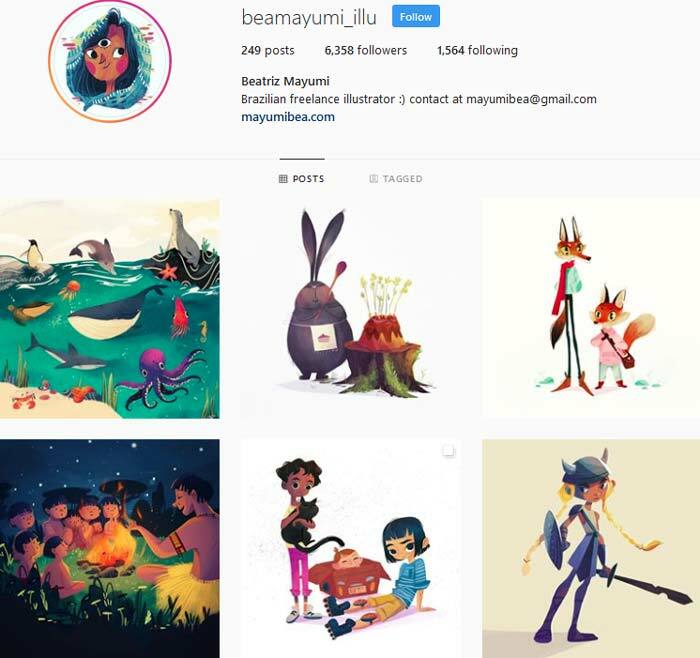 Beatriz dose adorable character designs and animals, often with some kind of storytelling going on in the drawings. 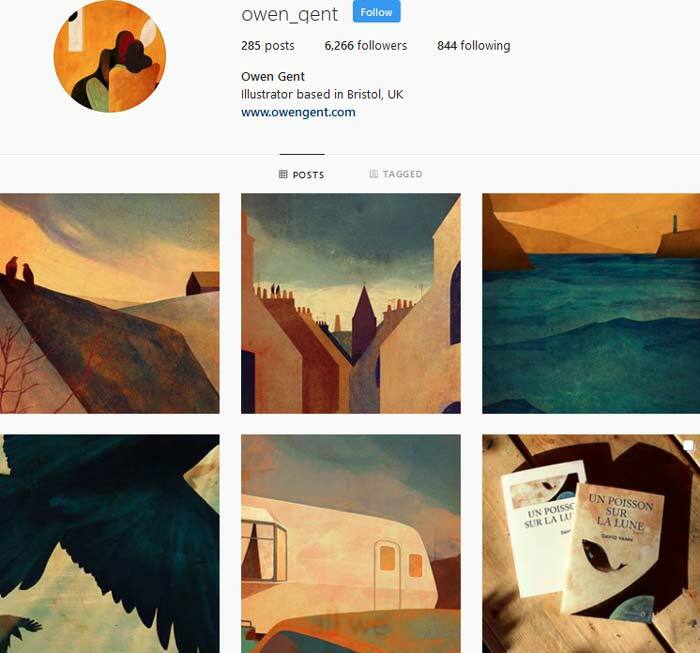 Owen Gent is a British Artist and Illustrator. In his work he creates these moments that are like taken from a movie scene, something has just happened but we can only imagine what. 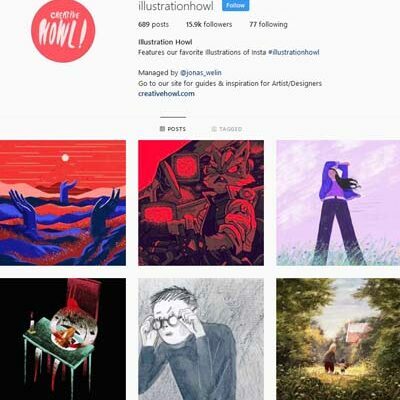 You’ll find dreamlike scenarios mixed with landscapes done with lovely color choices and shadows on Owen’s Instagram. 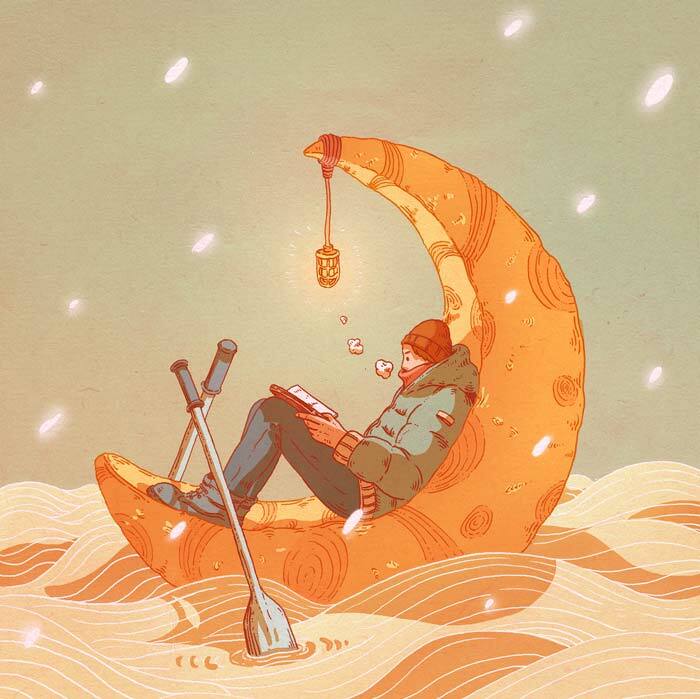 Lucas Wakamatsu is a illustration artist and designer from Brazil. 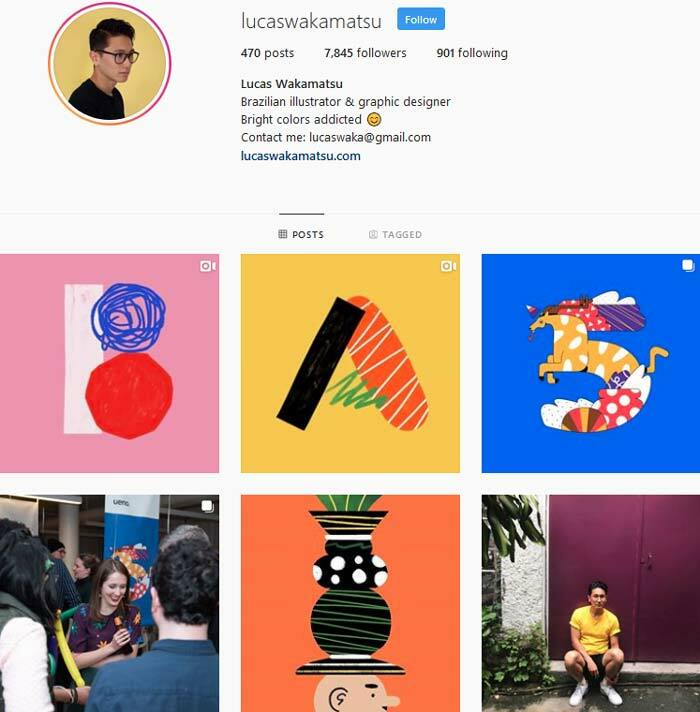 The people in Lucas drawings often have these long fat arms and legs that stretches across the artwork, also with the help of patterns and colors it creats these graphic lines and great composition in his work. 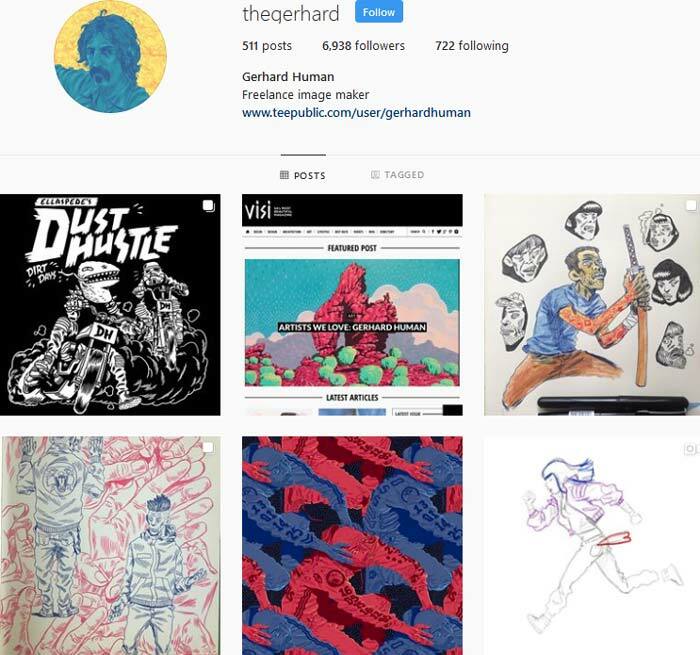 Gerhard Human is a artist and comic artist from South Africa. 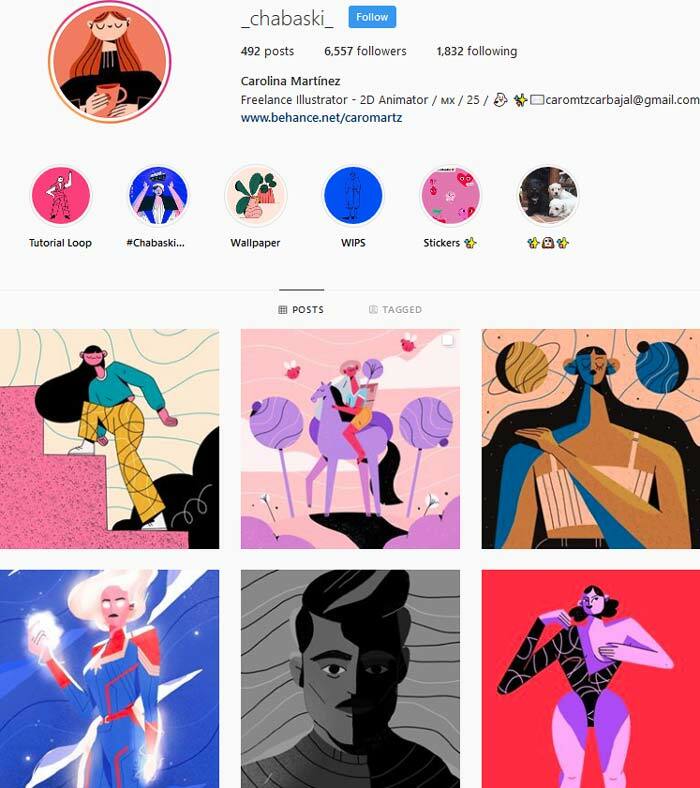 I love his bold color choices through out his amazing illustrations, many of my favourite works of his he’s using a limited color palette that makes his detailed drawings really interesting. 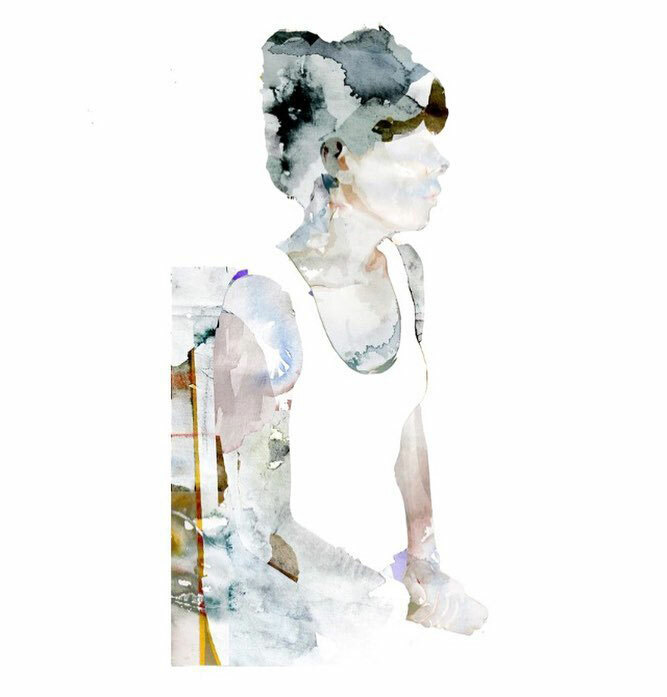 Nicole Xu makes art where big watercolor strokes creates a flowing feeling though her work. 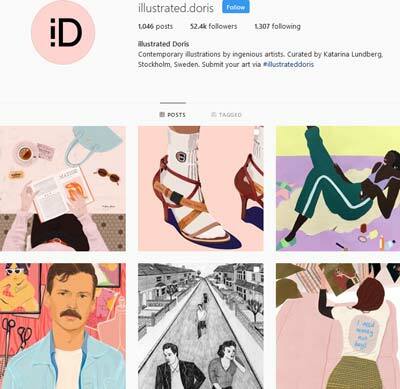 She also regularly upload her editorial illustrations which is also interesting to follow. 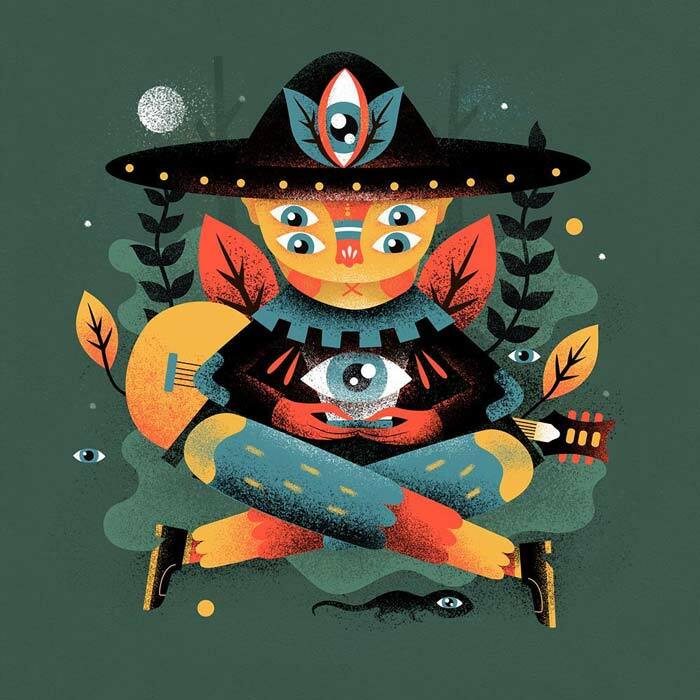 Carolina Martínez is a Mexican illustrator that make these often geometrical characters and landscapes in color choices that really pops the screen. 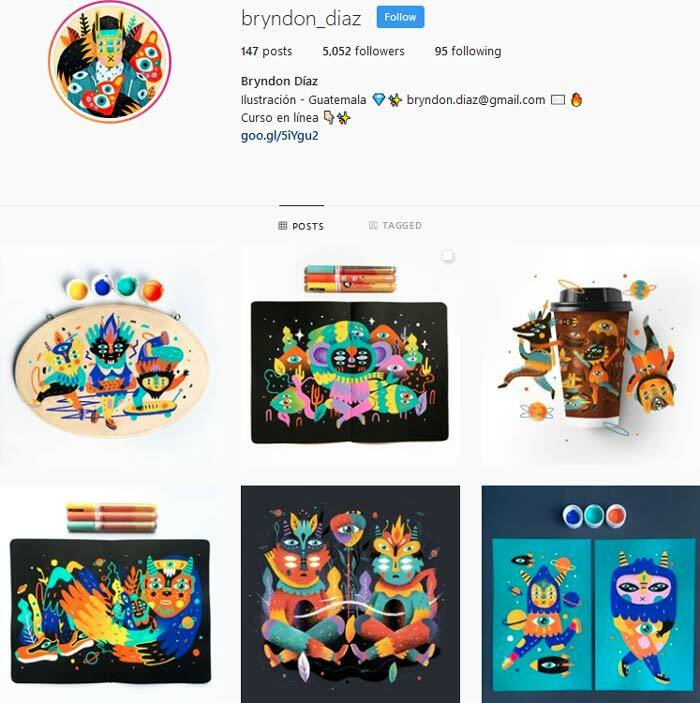 Bryndon Díaz is a illustrator from Guatemala. 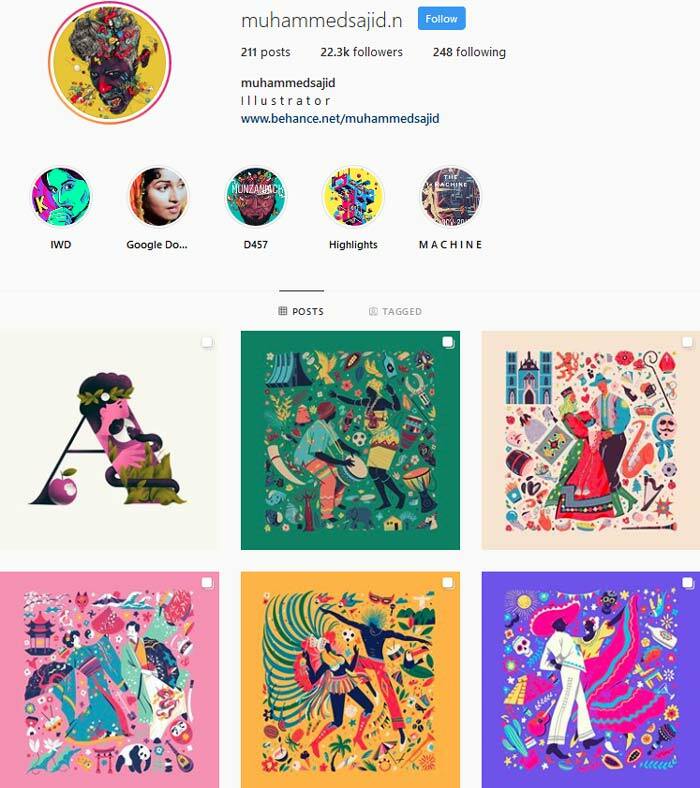 He’s the creator of these colorful illustrations filled with patterns, eyeballs and things happening on every inch of the canvas. He also makes sculptures & murals in his signature style which I truly love, something magical happens when his art comes to life like that. 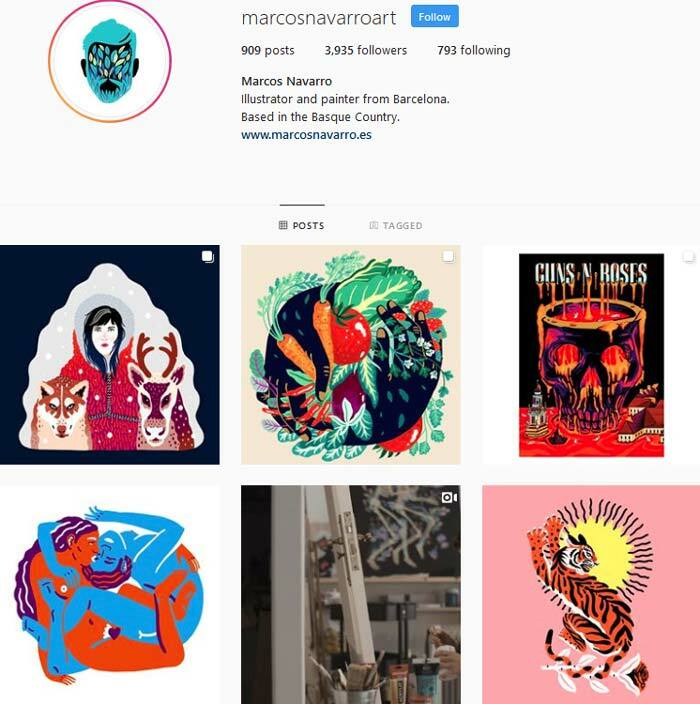 Marcos Navarro is a painter and artist that takes a lot of inspiration from nature and all the patterns you can find there. 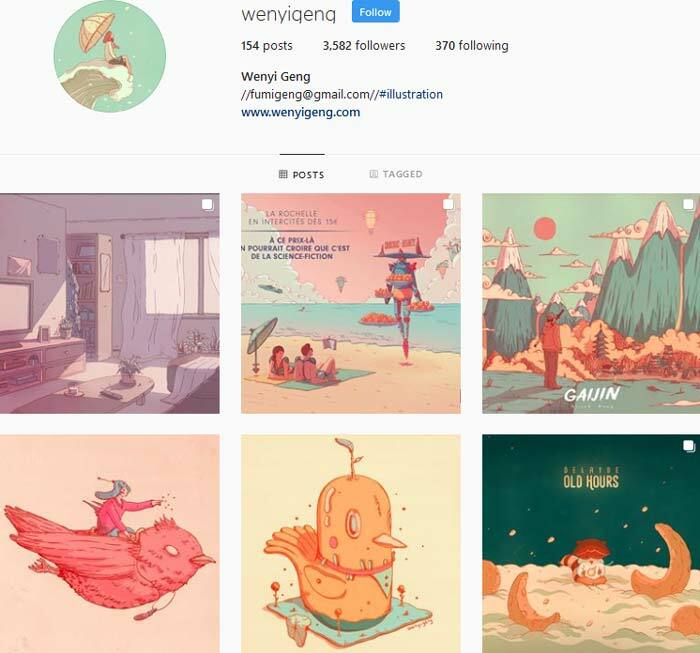 Wenyi Geng work often has a soft glow to it, making it feel like a warm red sun is glowing in on her work. 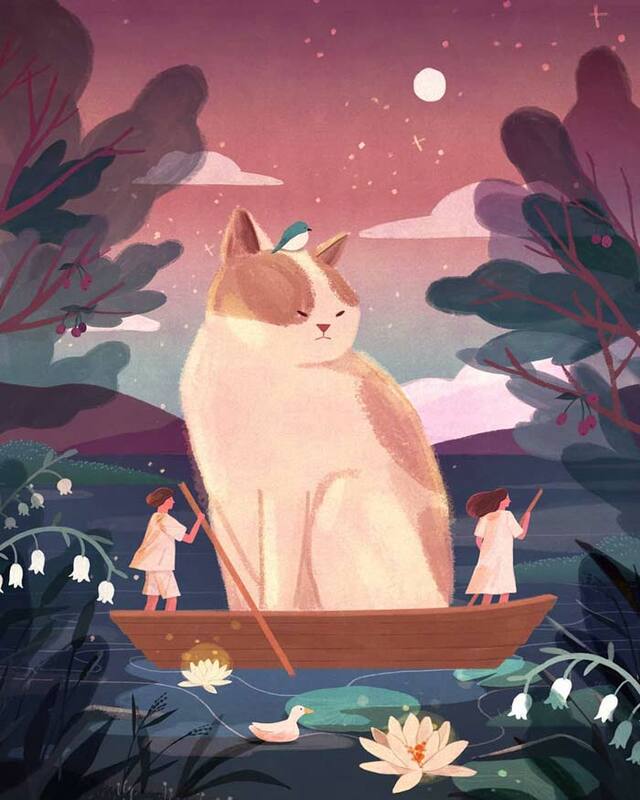 Wenyi’s work features dreamlike scenarios filled with serenity and wonder. 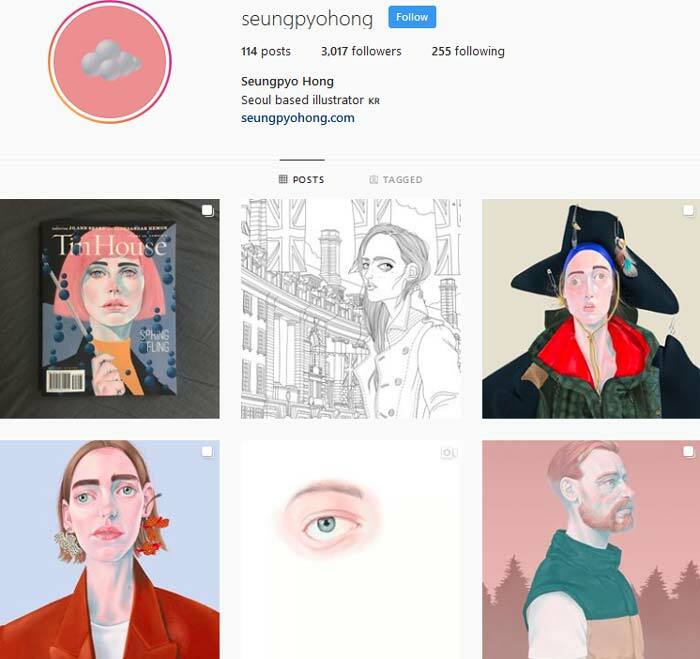 Seung-pyo Hong is an Illustrator and graphic designer based in South Korea. 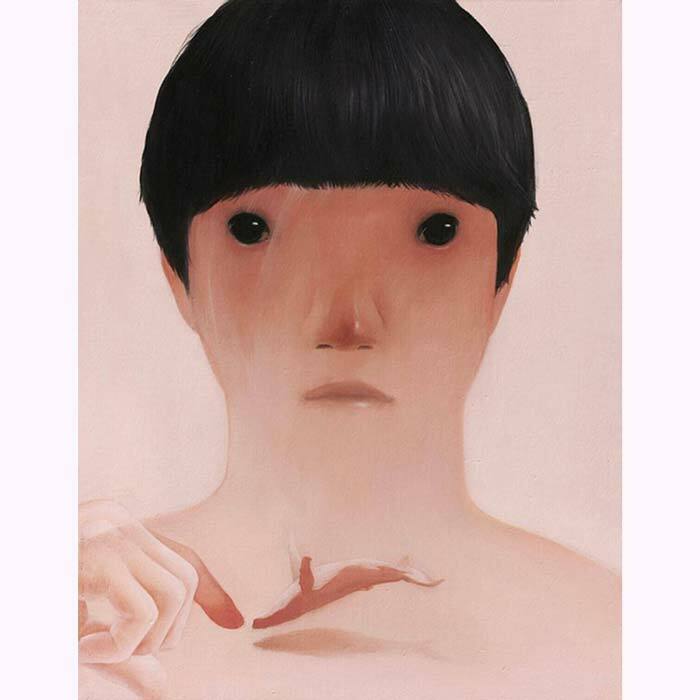 Hong’s interesting portraits demands your attention and the people in her work is impossible to not get fascinated by. 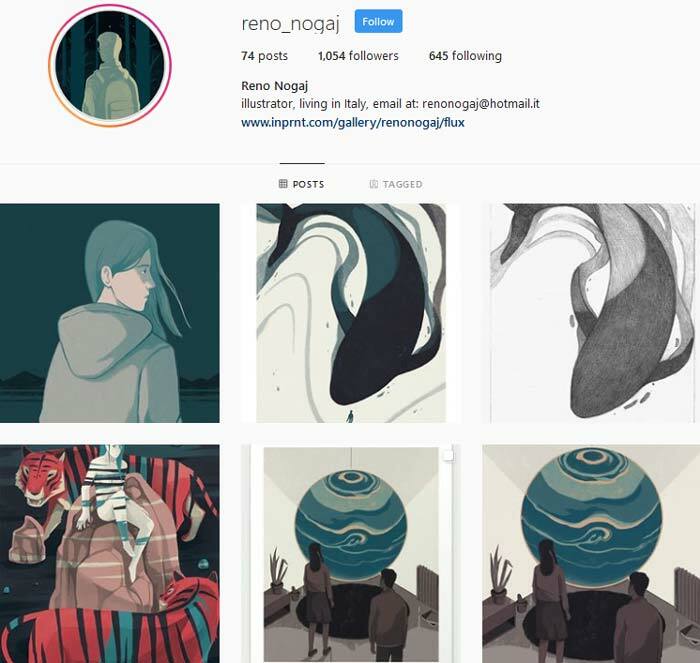 Reno Nogaj’s artwork often feel like taken from a dream, surreal scenarios where something isn’t as it should be, it makes for some really interesting storytelling in Reno’s work. 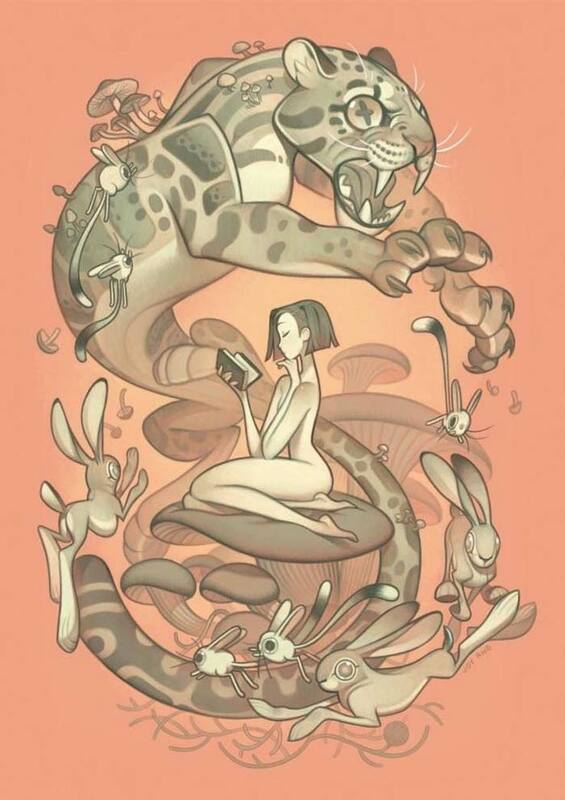 Joy Ang is a talented artist with a lovely art style. 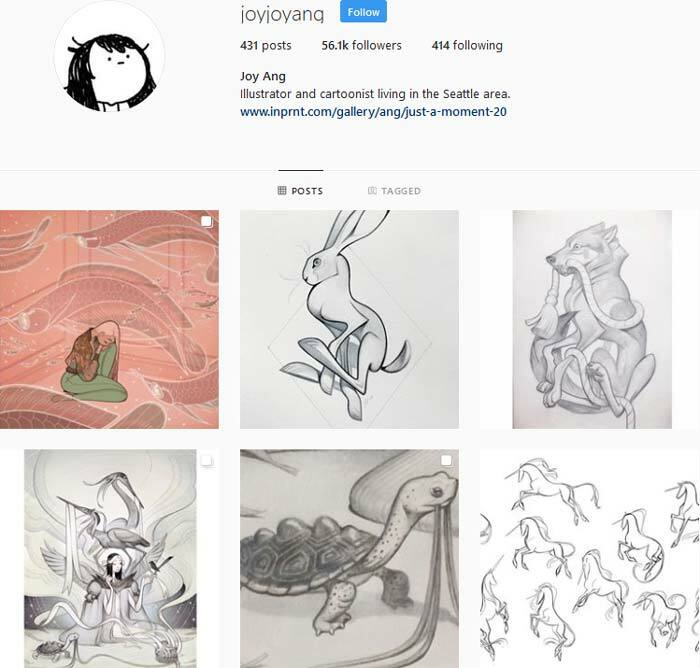 Joy is an versatile artist and that done a lot of different things, everything from publishing her own children’s books, worked with some huge companies in the comic and gaming world. 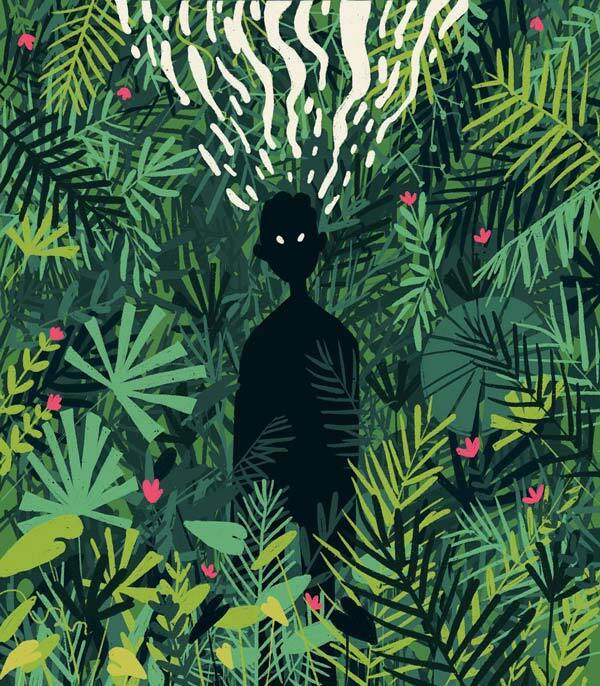 Ben Bauchau is an Illustrator and Concept Artist from Belgium. 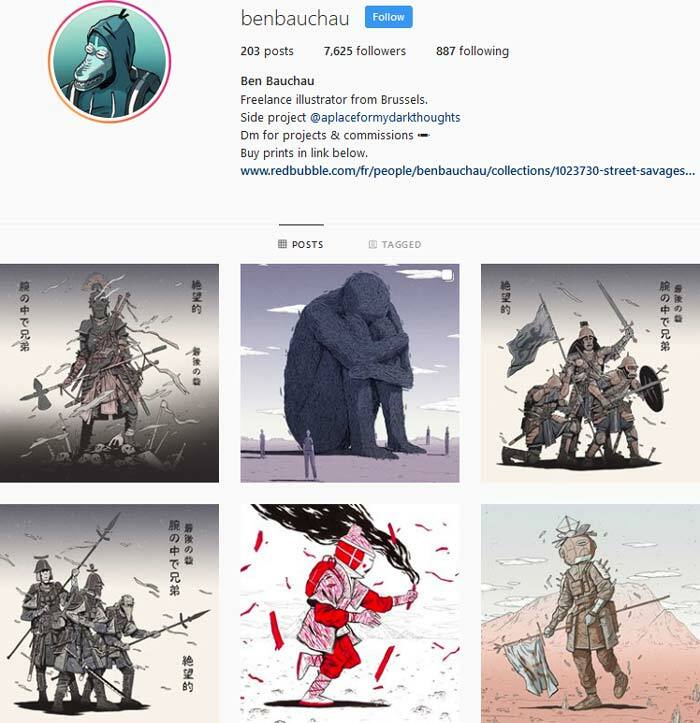 I love Ben’s badass character designs, they’re like taken straight from a video game (of my dreams). 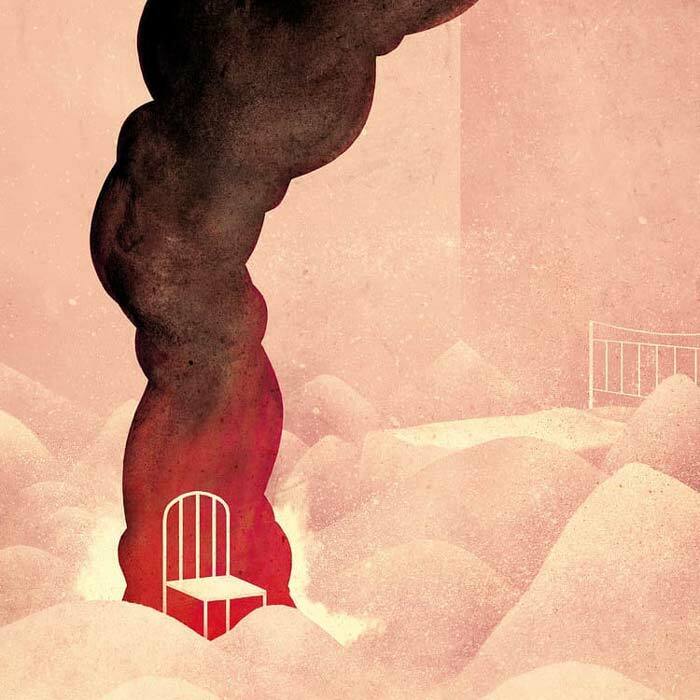 Jess Heitzenrater is an American illustrator and printmaker that makes these expressive and fantastic illustrations. 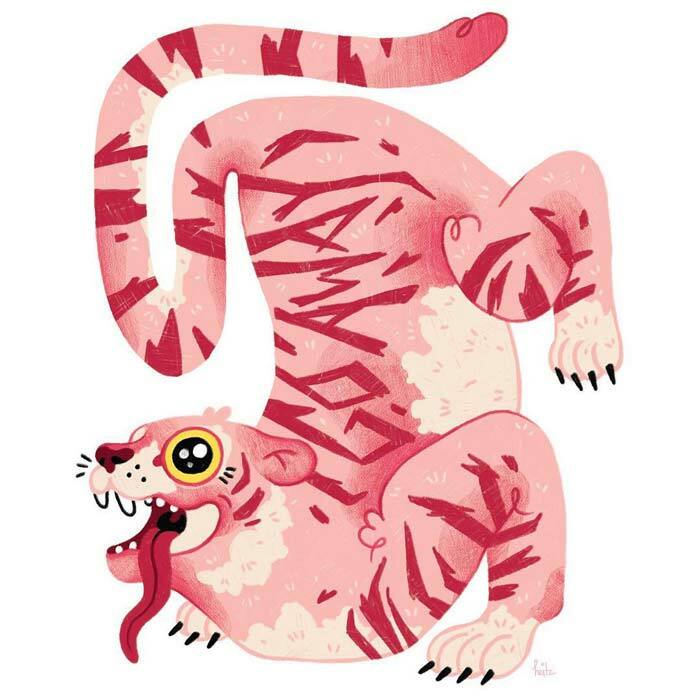 The pink tiger below is one of my many favourites from Jess (yes, I know I have a thing for tigers). 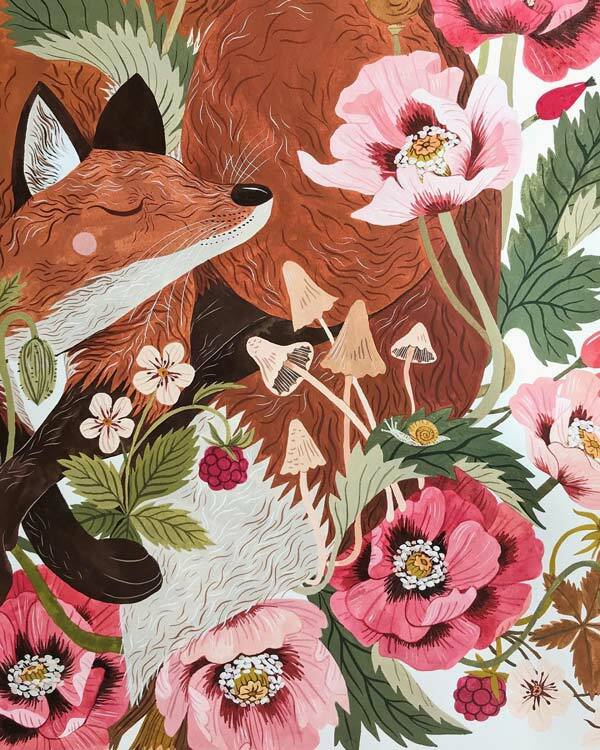 Frida Clerhage is a Swedish illustrator and pattern designer that makes these lovely floral patterns and animal portraits. 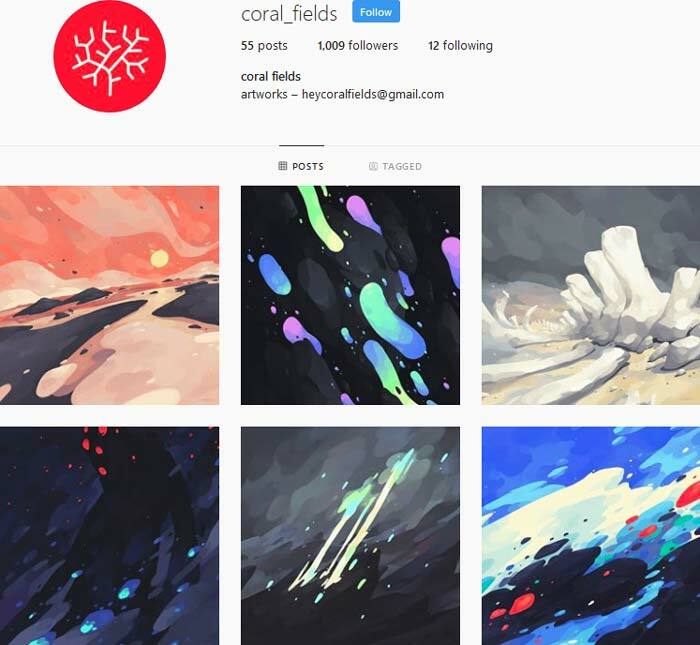 Coral fields is a Instagram page where the artist behind the page creates these imaginative landscapes that feel like there taken out of a sci-fi movie or something. 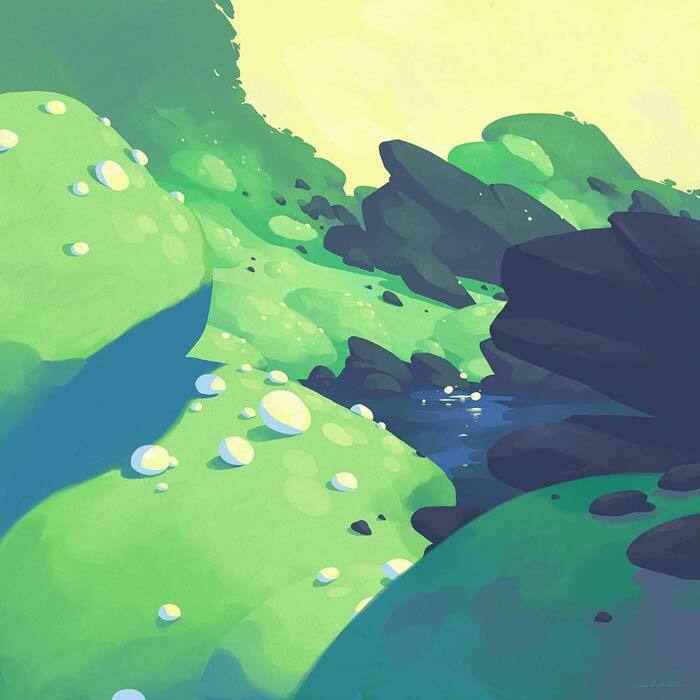 Abstract and also more figurative landscapes that makes the mind wander into the art, imagining what kind of planet it is and what’s taken place there. 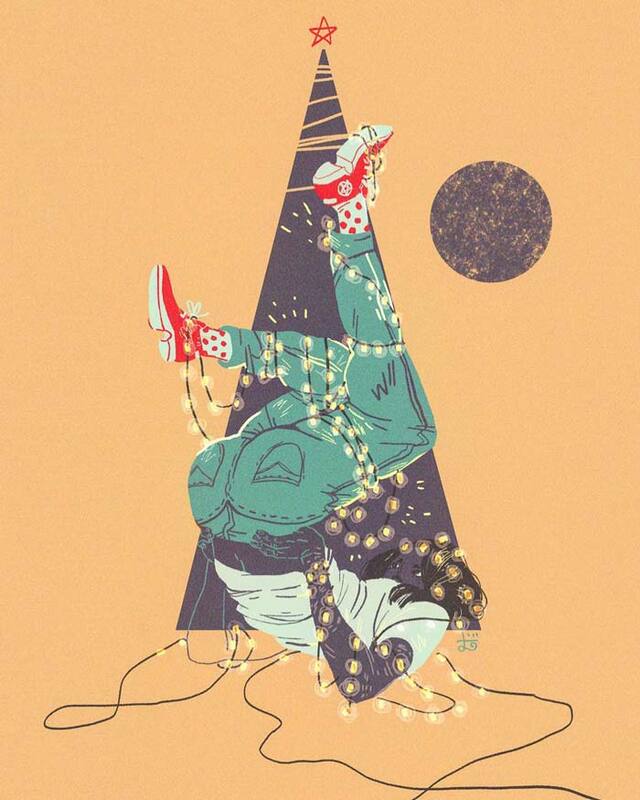 Sander Berg is yet another fantastic Swedish illustrator on Instagram. 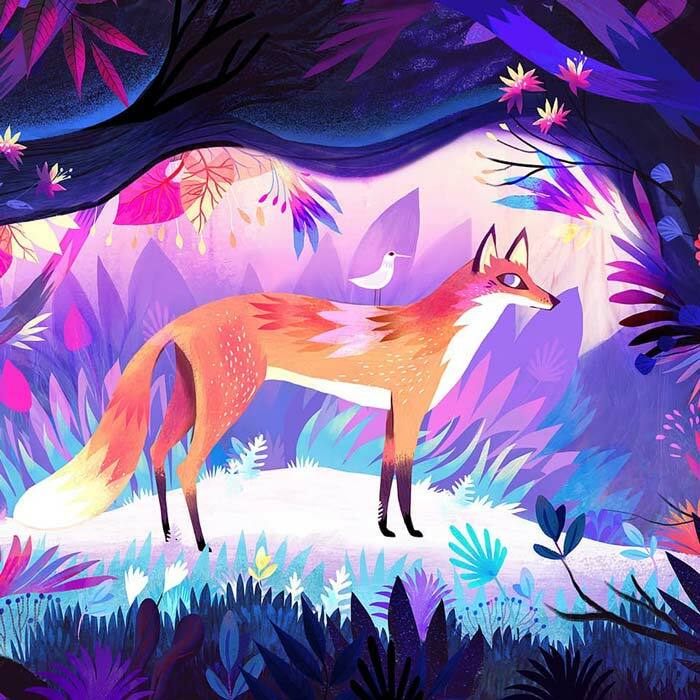 Sander makes some of my favourite digital illustrations, like the magical fox illustration below. 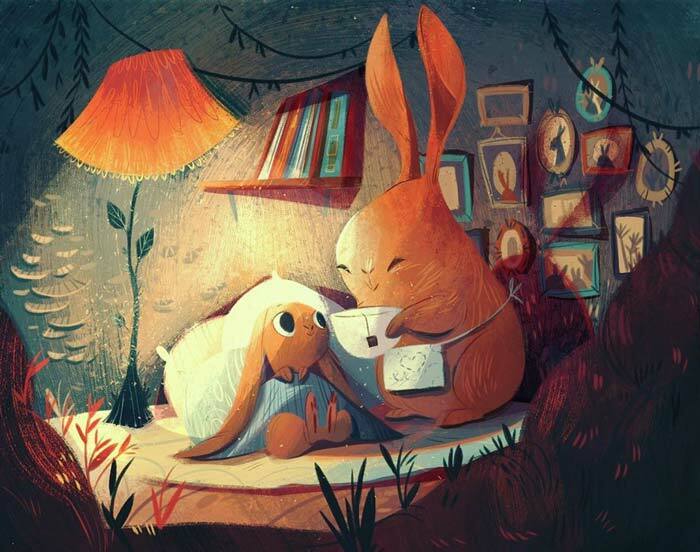 Emma Hanquist is a freelance illustrator from Sweden. 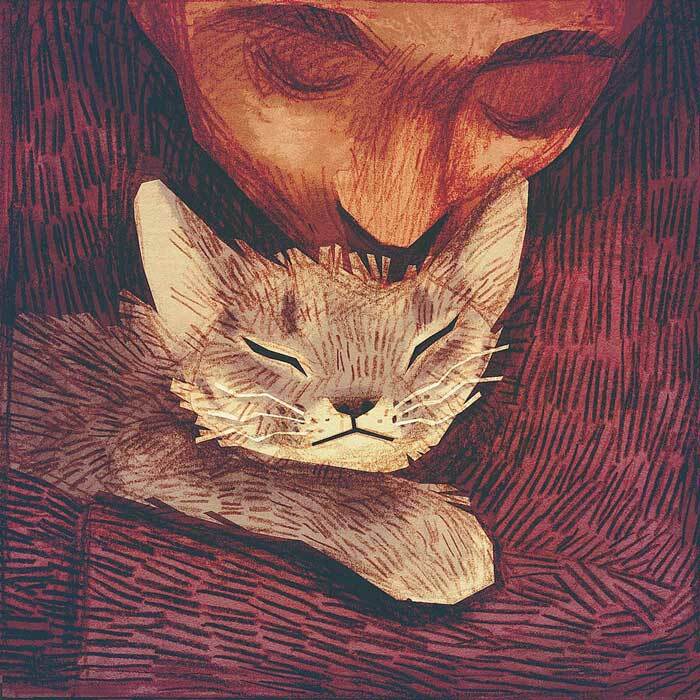 Her drawing style is unique and lovely, with luscious noses and a great sense of storytelling. 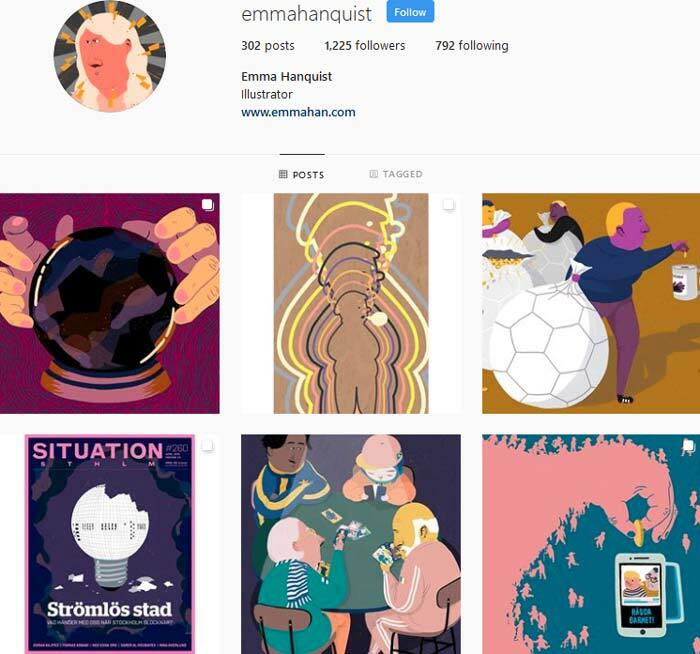 If your looking for a artist that dose great editorial illustrations in a fun style Emma Hanquist is for you.